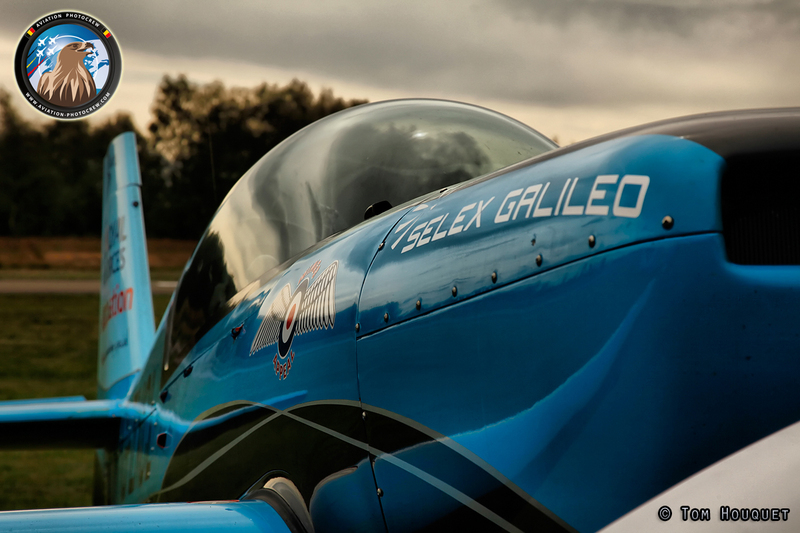 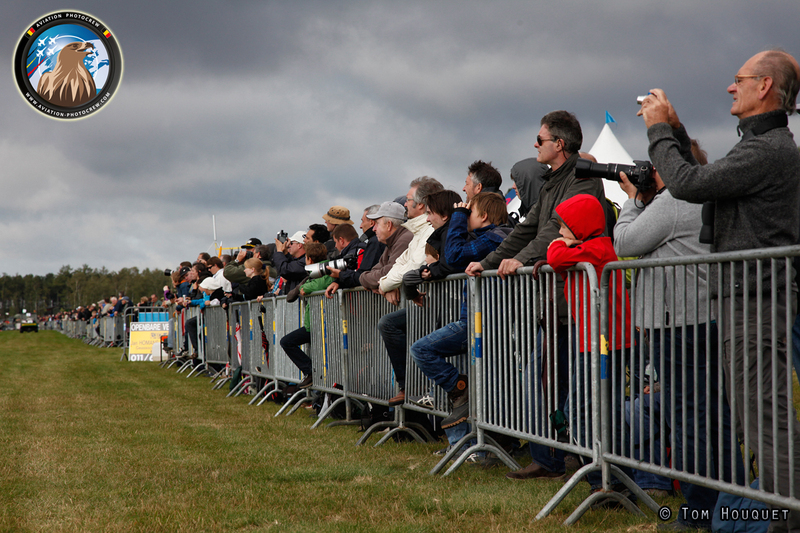 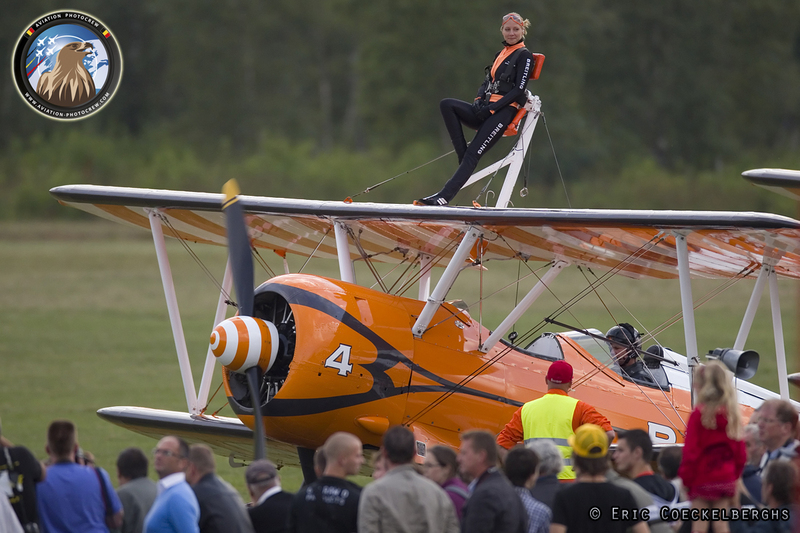 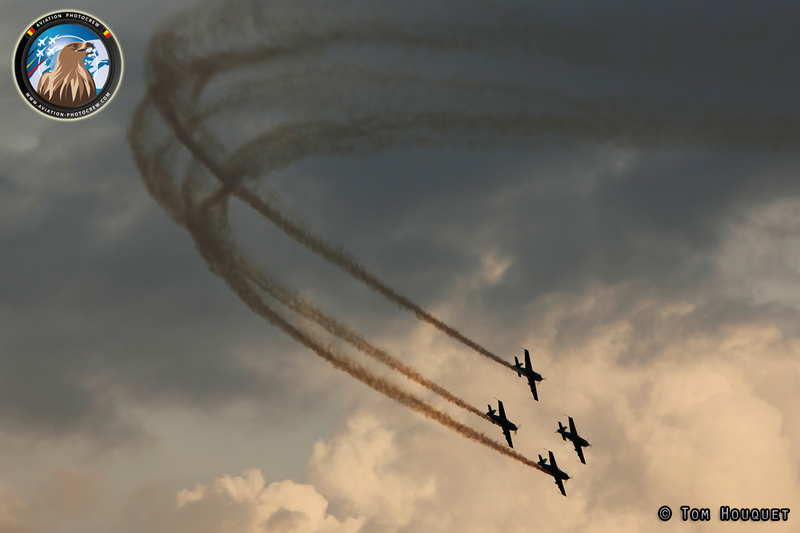 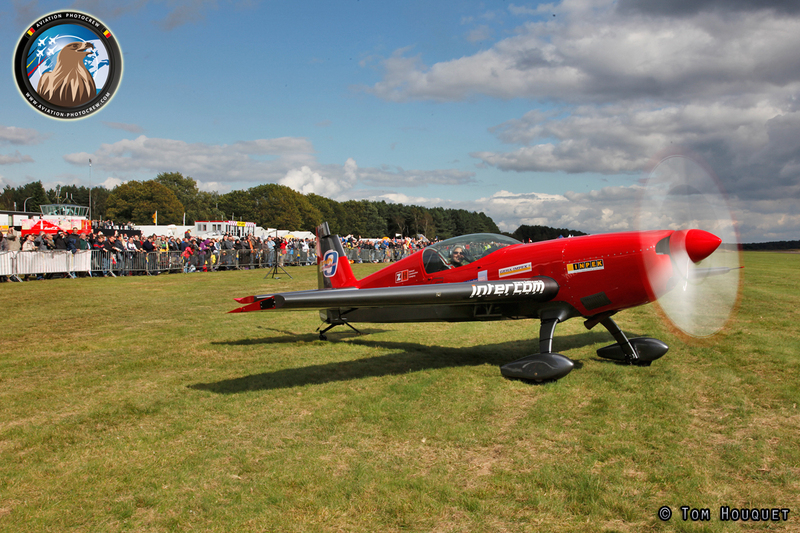 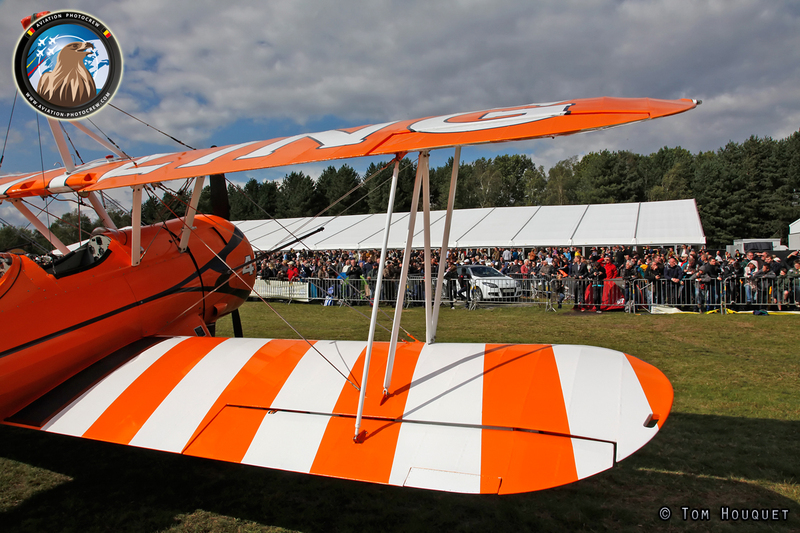 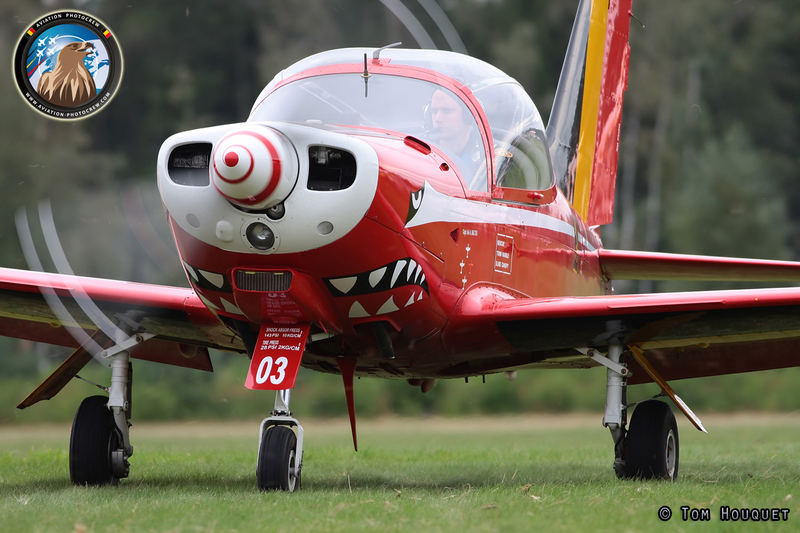 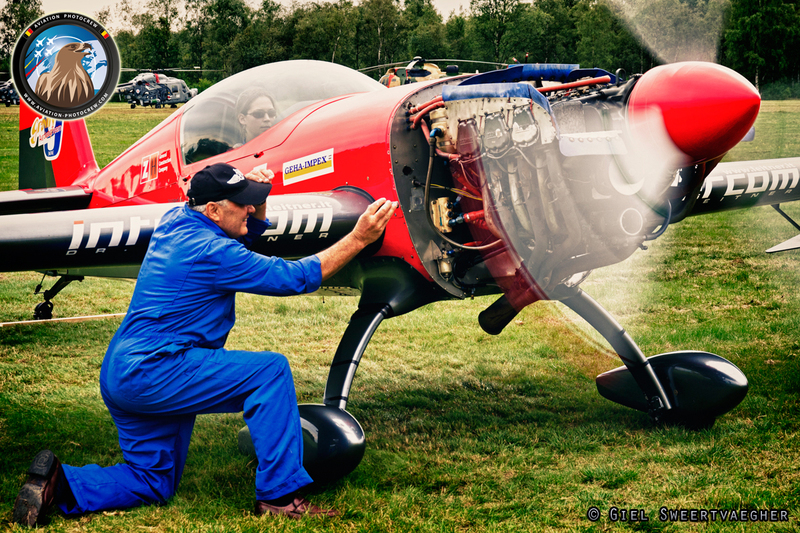 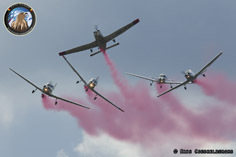 For the 35th time the Sanicole Aeroclub organized the international Airshow at the Leopolsburgs airfield. 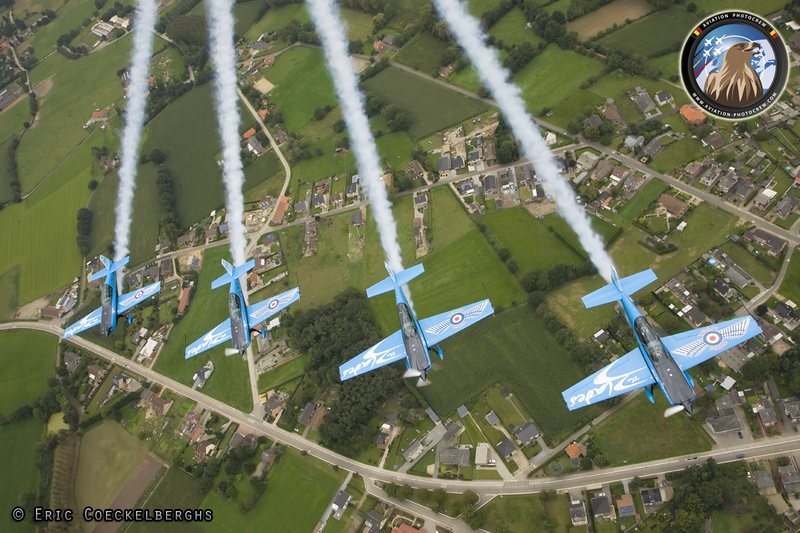 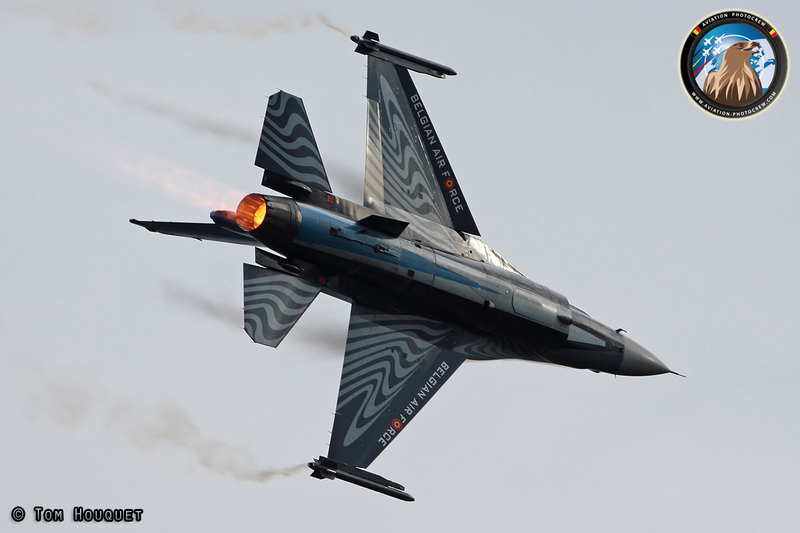 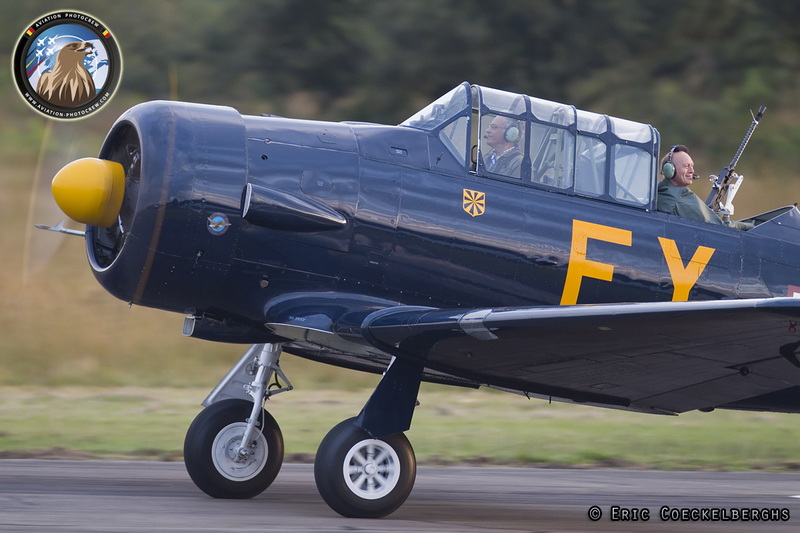 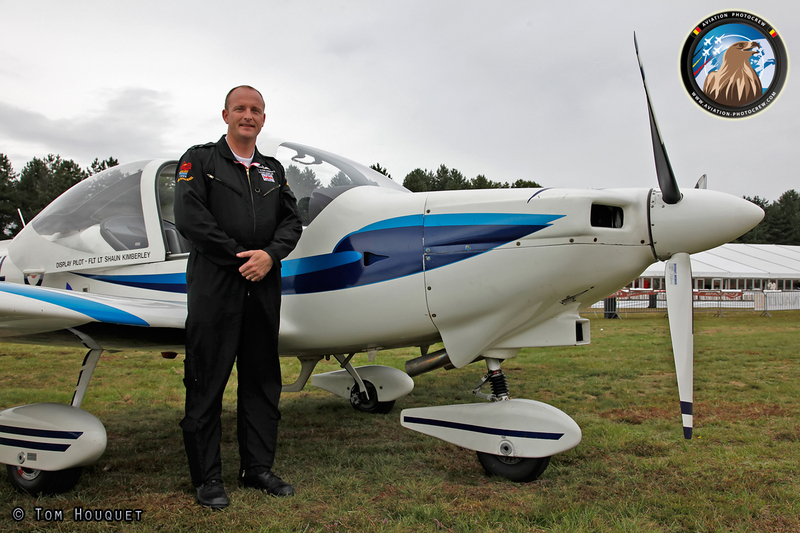 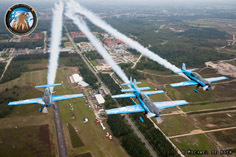 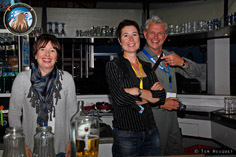 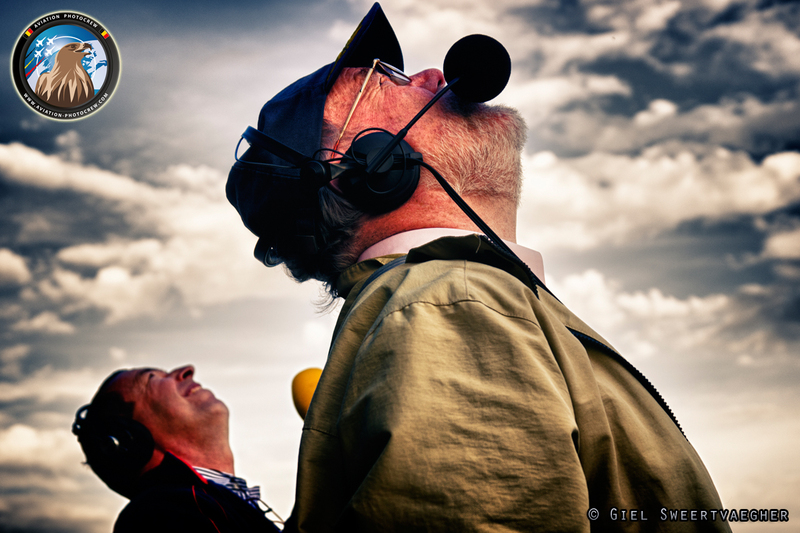 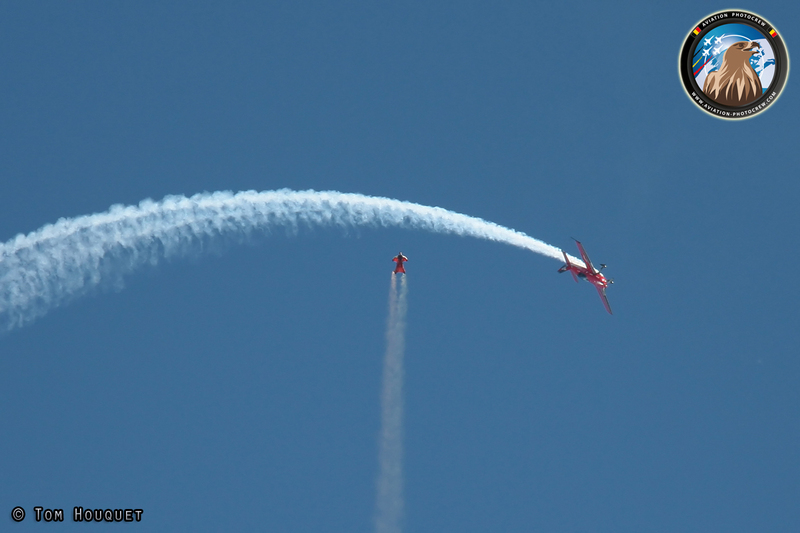 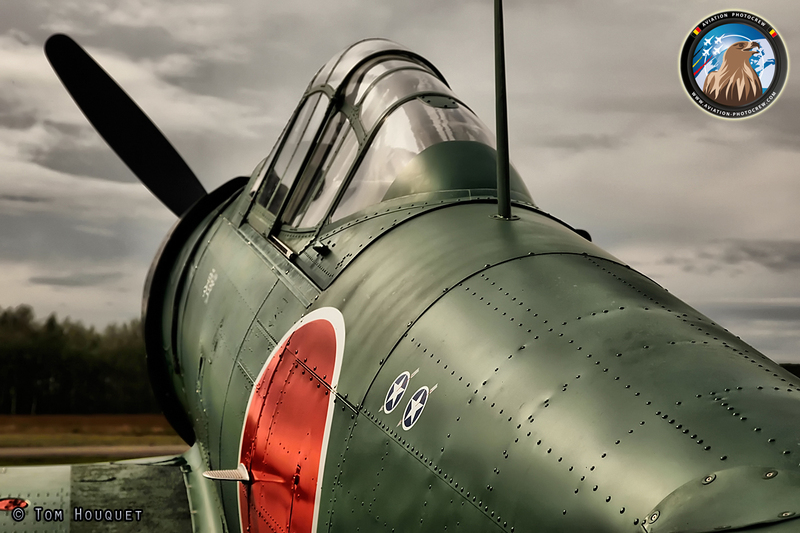 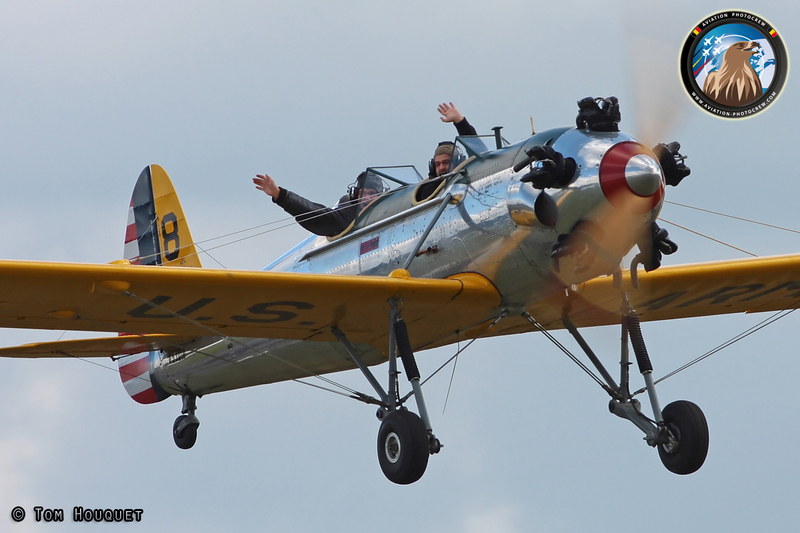 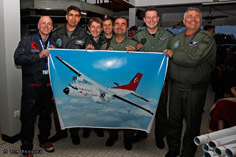 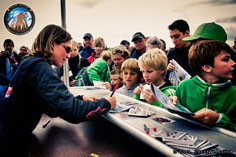 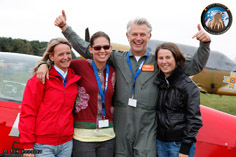 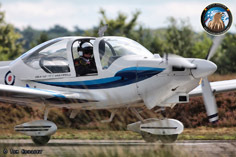 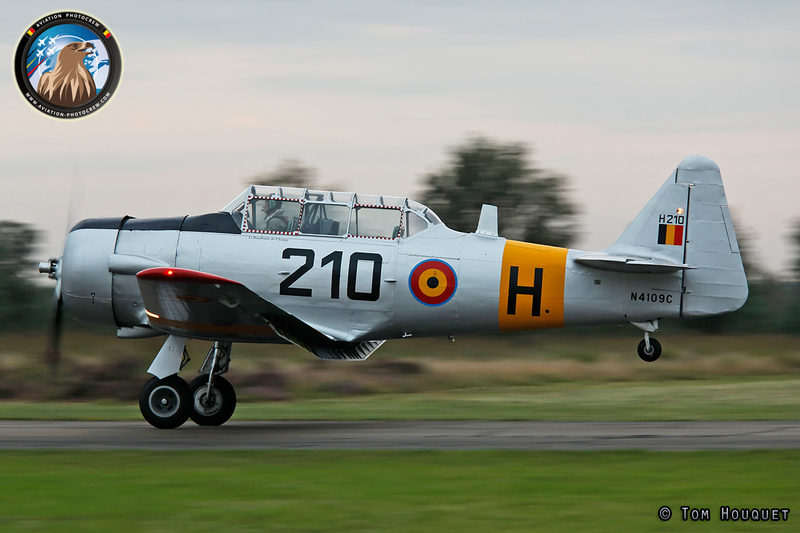 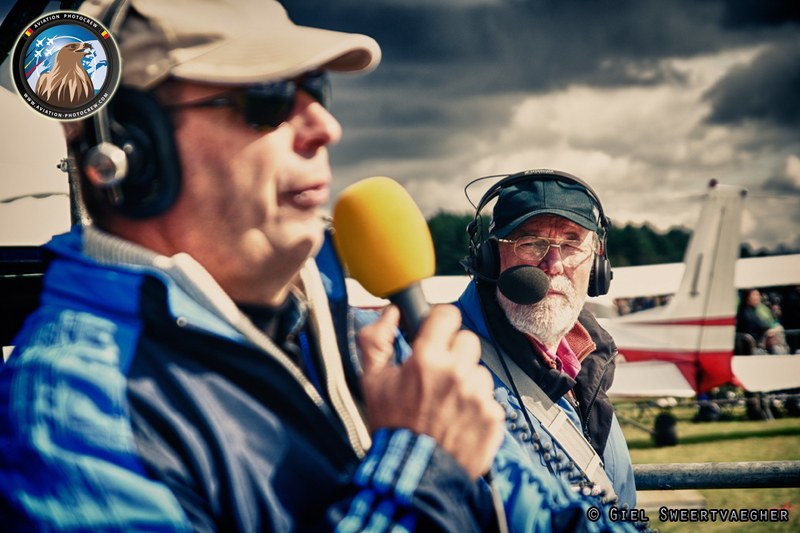 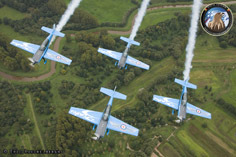 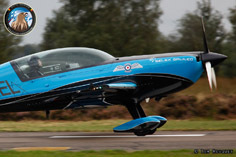 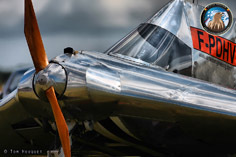 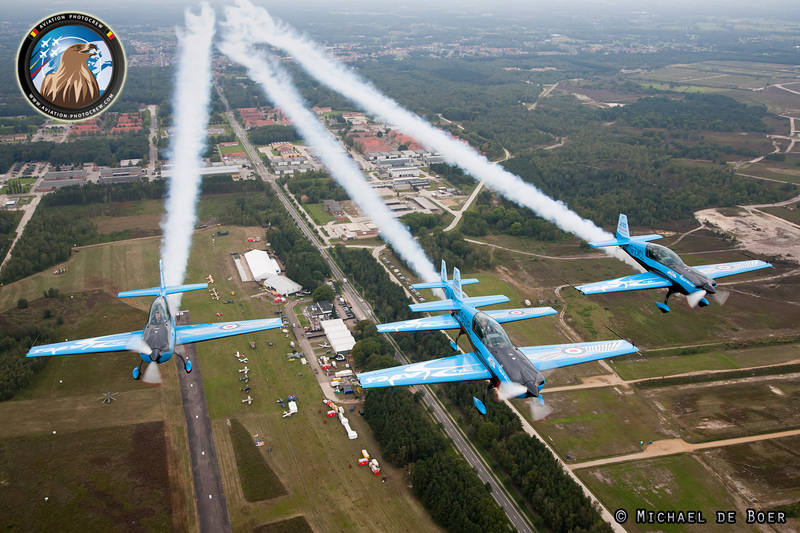 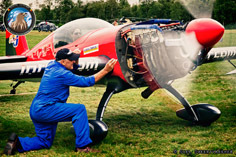 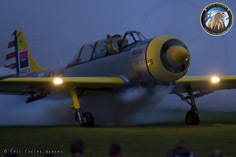 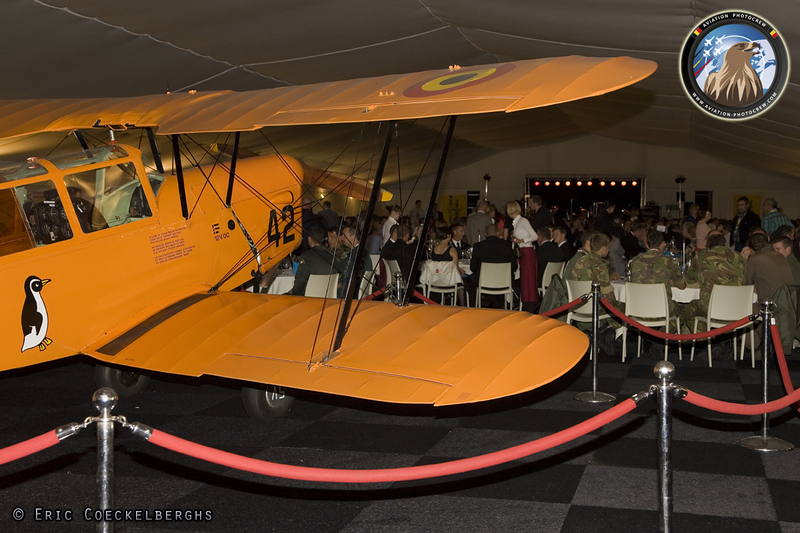 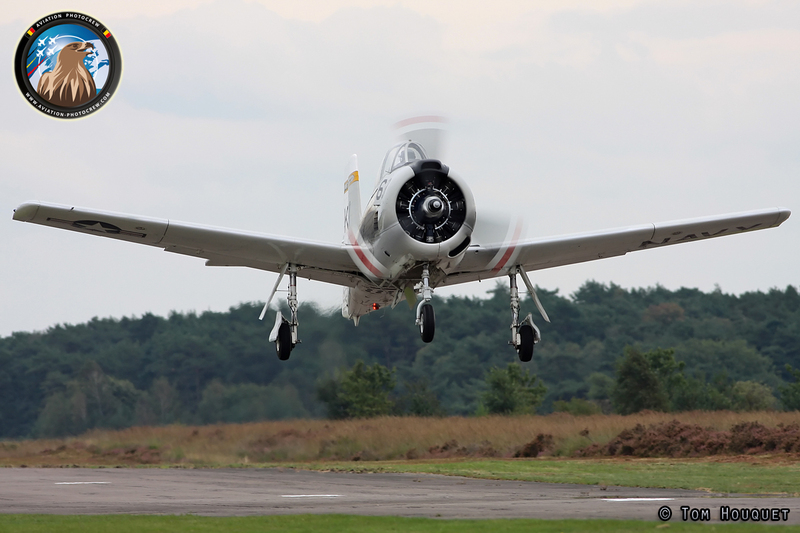 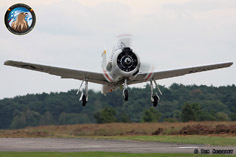 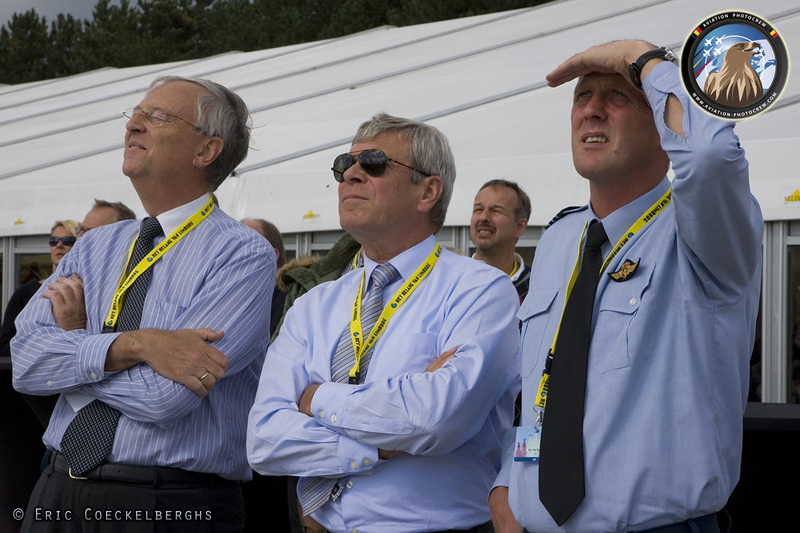 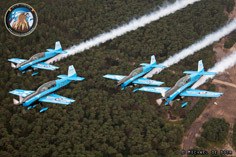 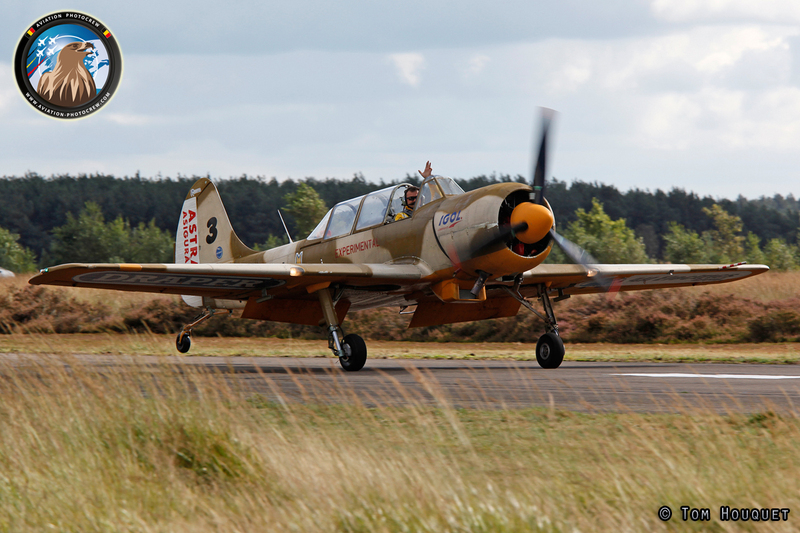 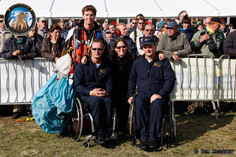 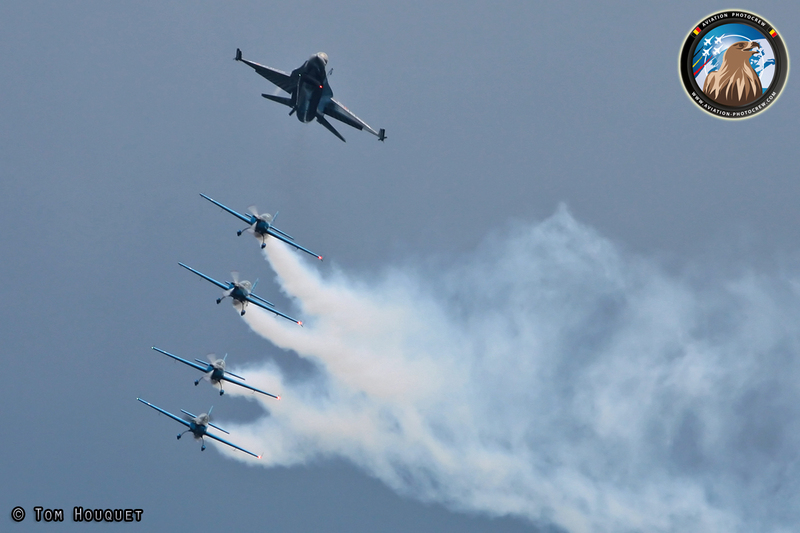 During these 35 years of excellence, the organization lead by the Bueckenberghs family, has grown to one of the best known Airshow in Europe and the sole surviving civil Airshow in Belgium. 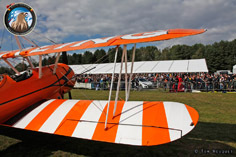 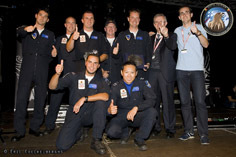 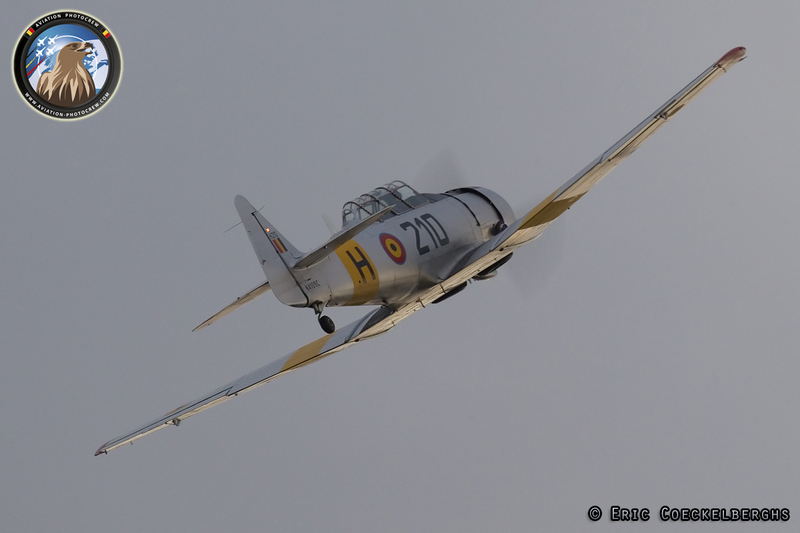 In all these years almost all European Airshow acts have passed the revue at Sanicole, and this year was no exception. 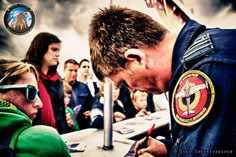 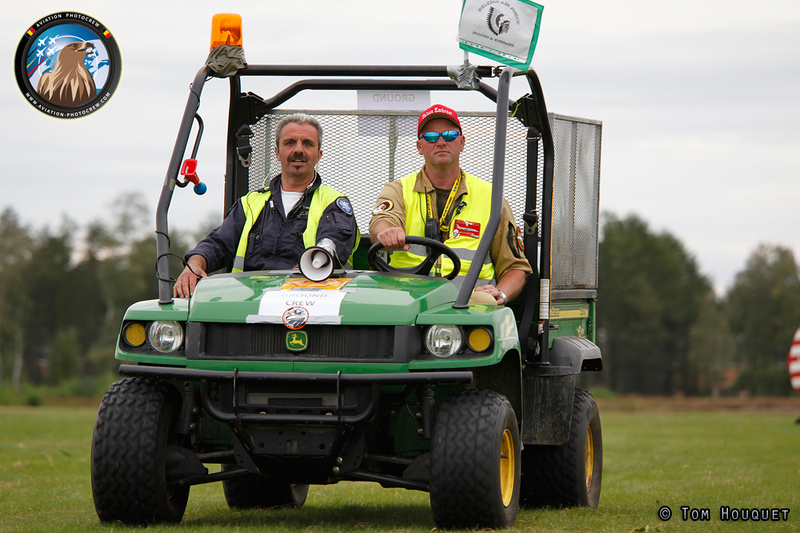 The Airshow organization can count on more then 500 volunteers who make this extraordinary event possible. 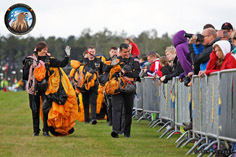 This can clearly be seen the days prior the event as everyone is busy with the build-up. 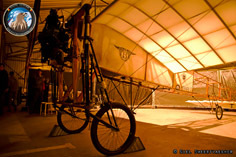 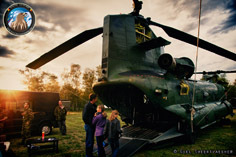 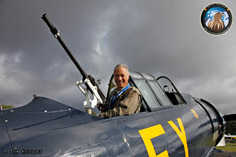 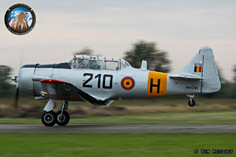 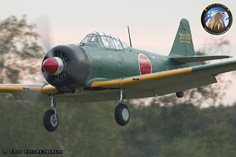 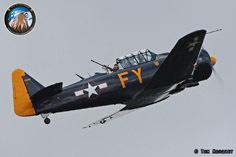 On Friday the first aircraft arrived and some rehearsals were flown in order to be fully prepared for the show opening. 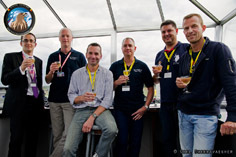 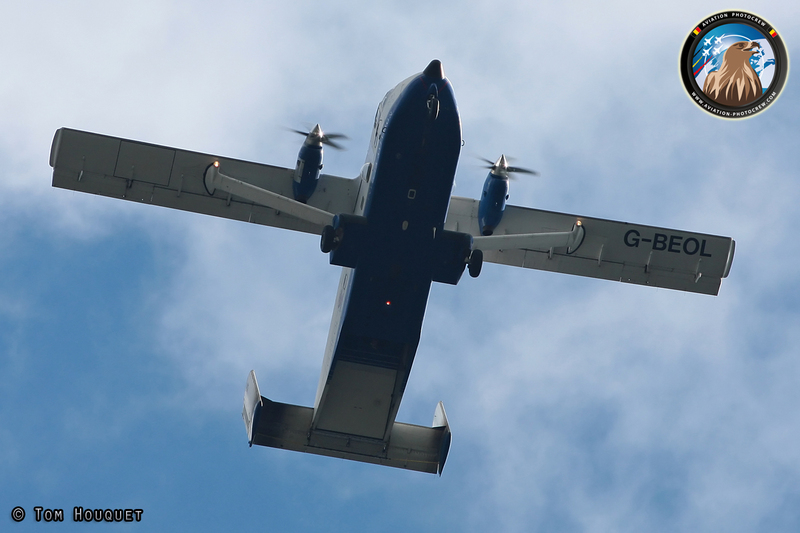 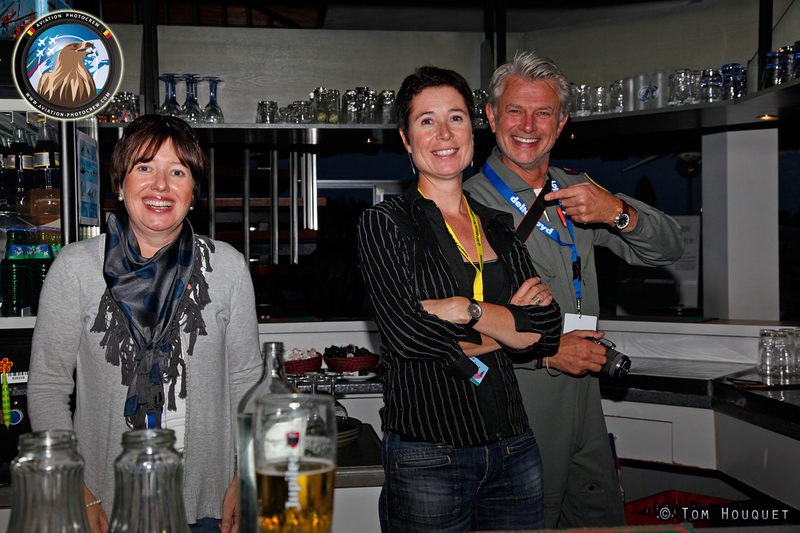 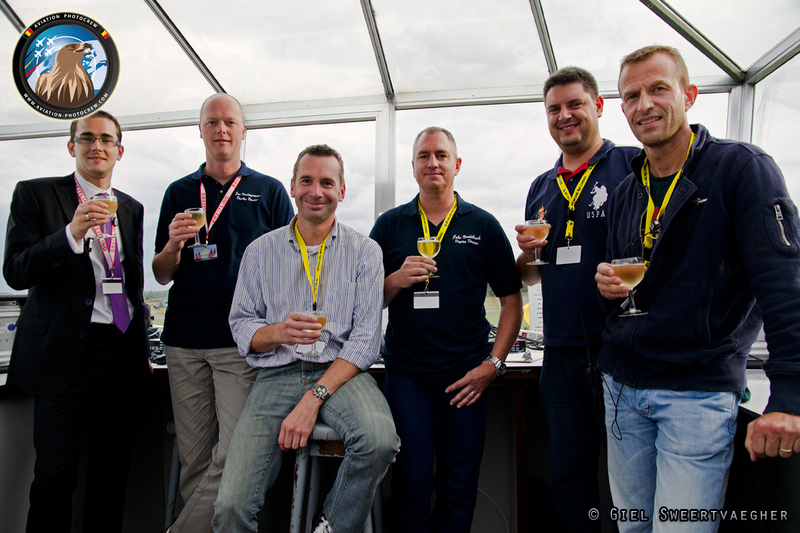 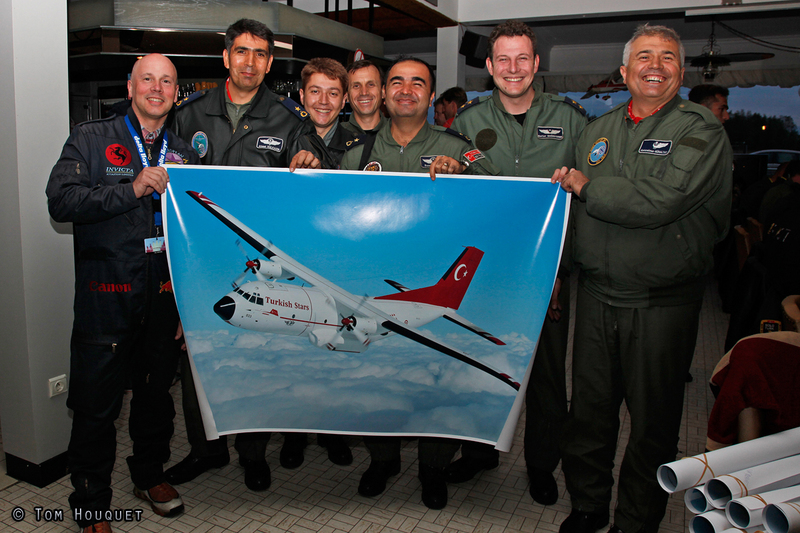 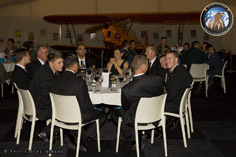 We were delighted to be able to organize a media flight with the Skyvan to pick-up the arriving UK team, the Blades. The four blue-colored Extra 300 were picked up by the photoship around Schaffen airfield and guided to Sanicole with a nice smoke pass above the aeroclub, resulting in some really nice pictures. 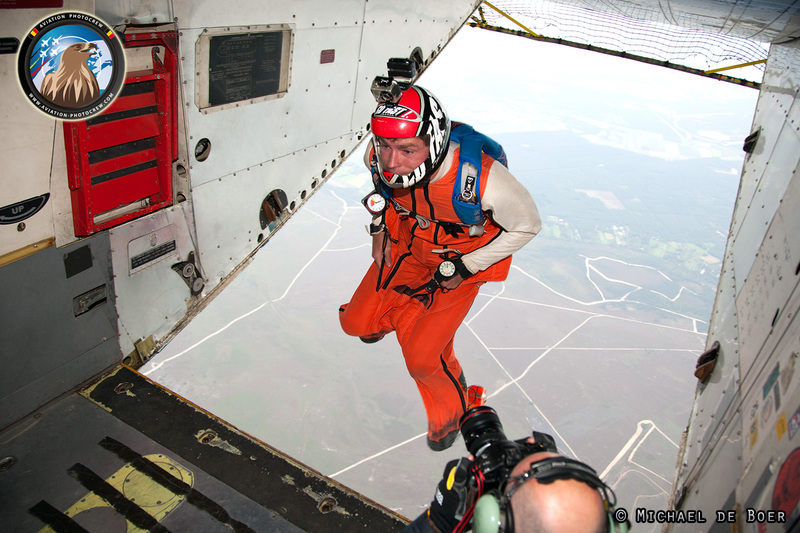 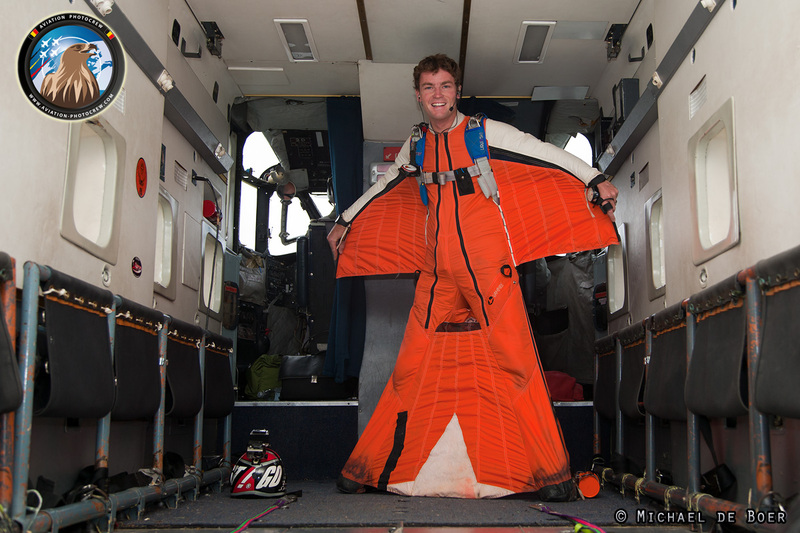 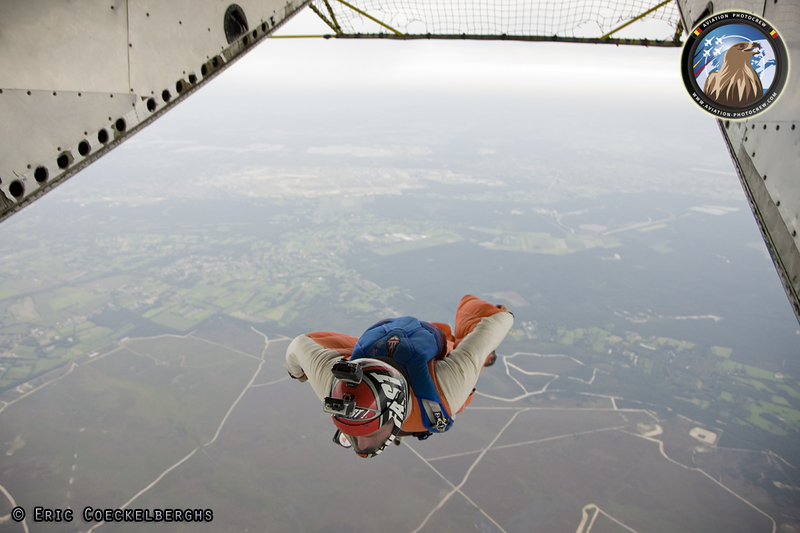 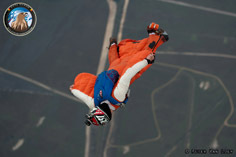 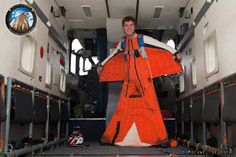 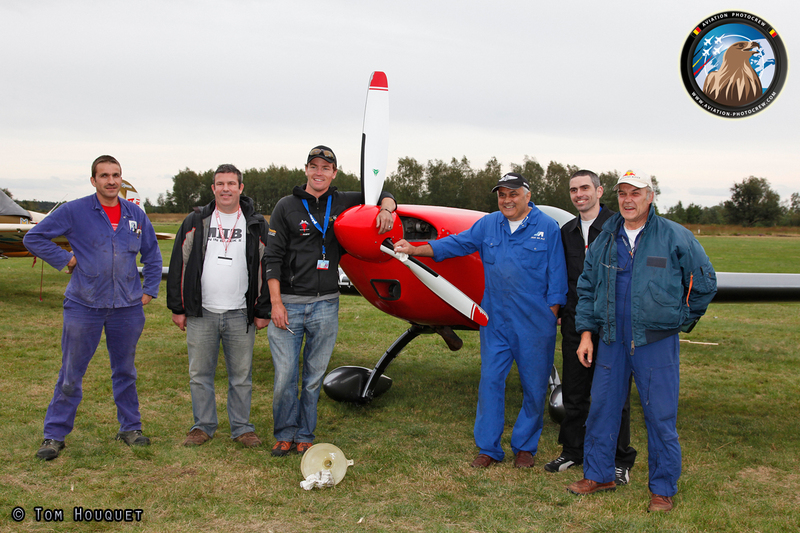 During that same flight, the famous US extreme sportsmen, Rex Pemberton, also joined us only to jump out after the photoflight. 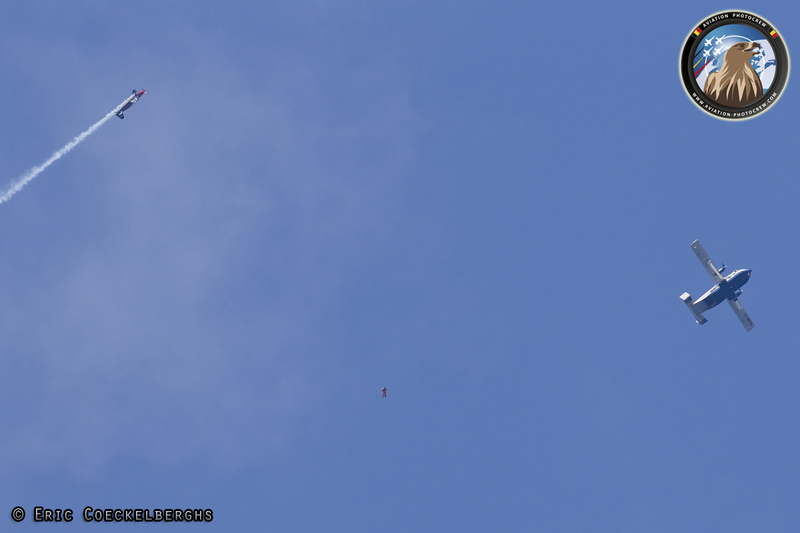 Luckily he carried a parachute with him, and he soared through the sky with his wing suite back to the airfield. 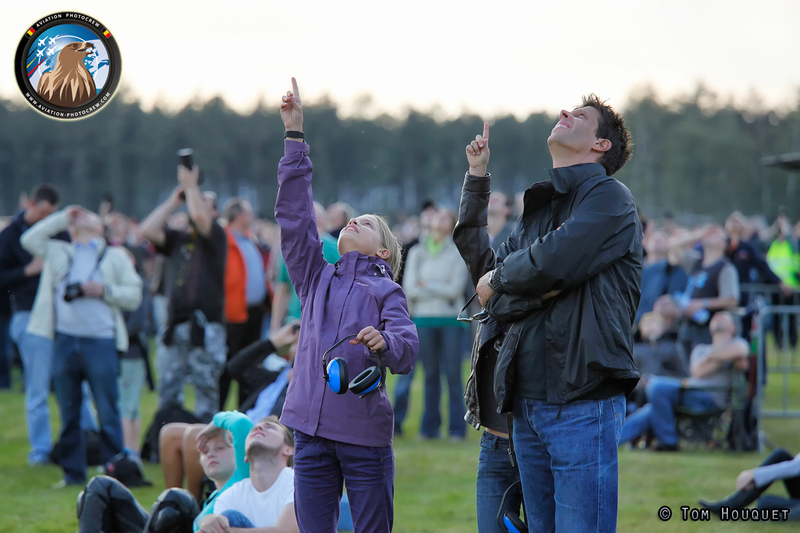 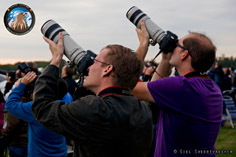 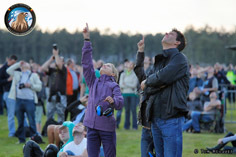 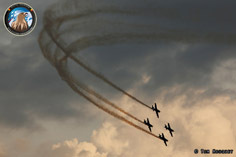 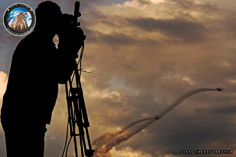 For the second year, the Airshow weekend was opened on Friday for the evening sunset show. 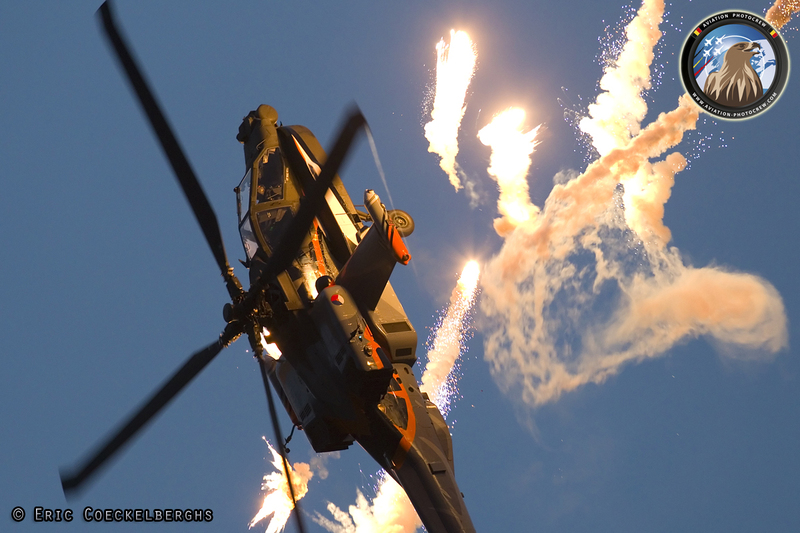 After the first edition the makes were set very high, but the organization succeeded in bringing the visitors again a very nice show with a great mix of aircraft, helicopters and loads of aerial fireworks. The public turned up in large numbers to see this unique show and the weather was perfect for flying. Opening the evening show was the US stunt combination of Melissa and Rex Pemberton. 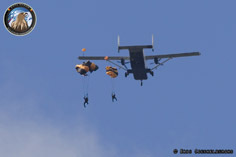 After Rex jumps out of the Skyvan, he flies to the airfield with his wingsuite while Melissa flies around him with her Extra 300. 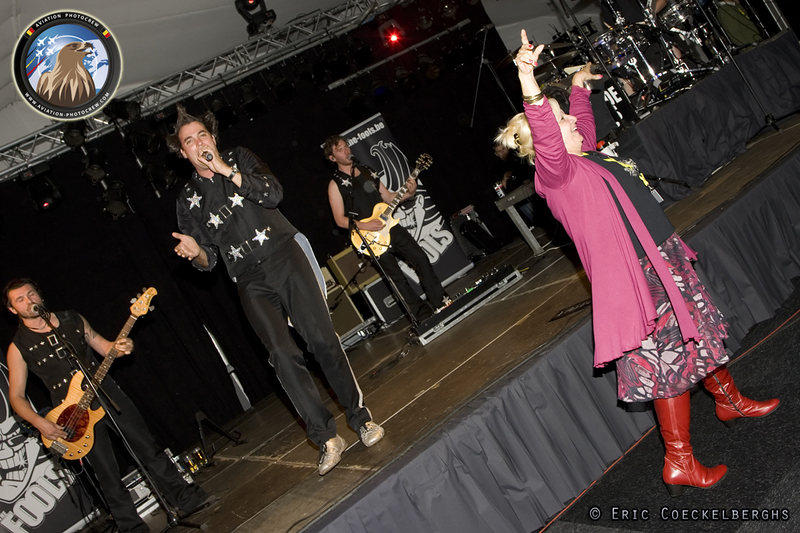 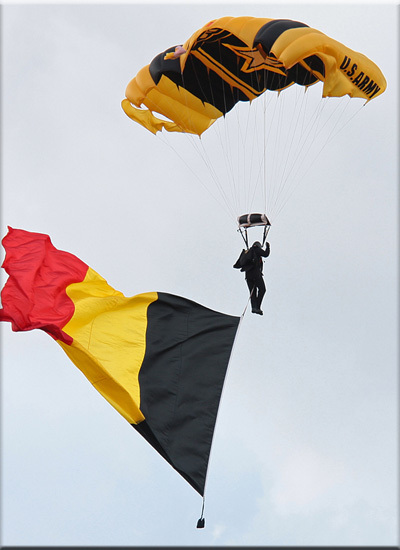 This unique combination was never seen before in Belgium and the public was really stunned by the performance. 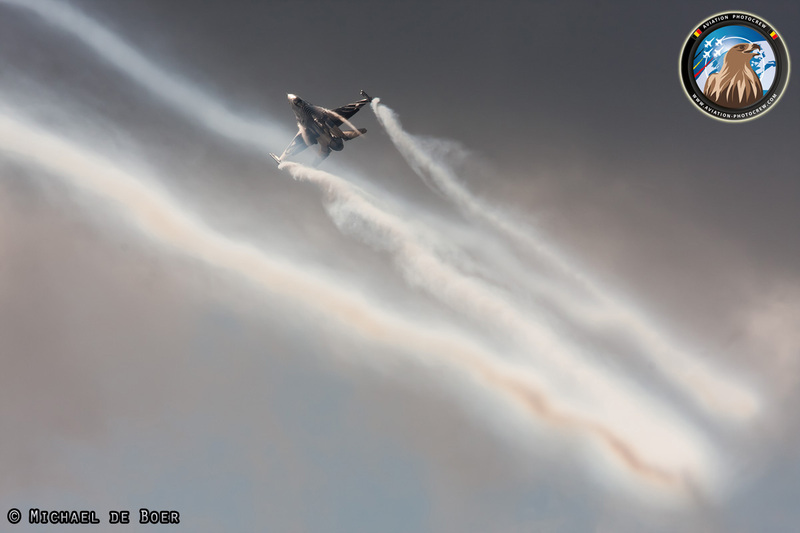 The Czech Air Force was the next performance with the Saab Gripen solo display which made use of flares to highlight its great maneuverability. 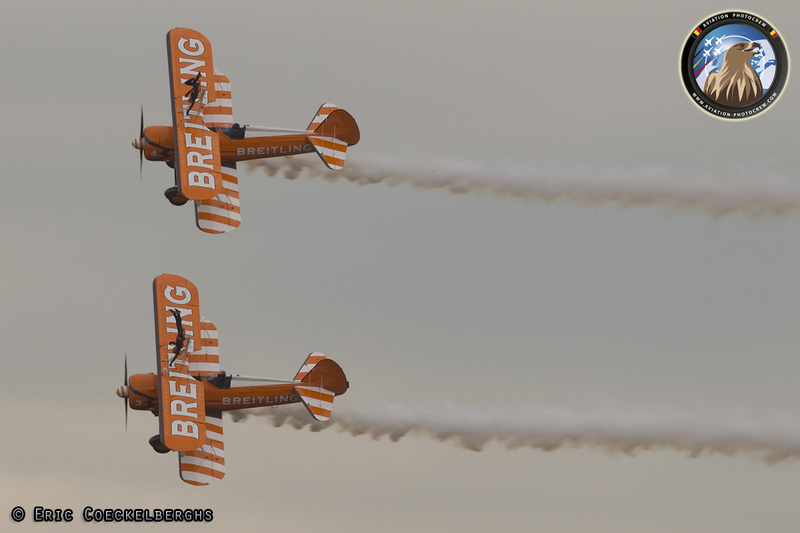 One of the crowd-pleasers were the Breitling Wingwalkers who put on a very nice performance in front of the public. 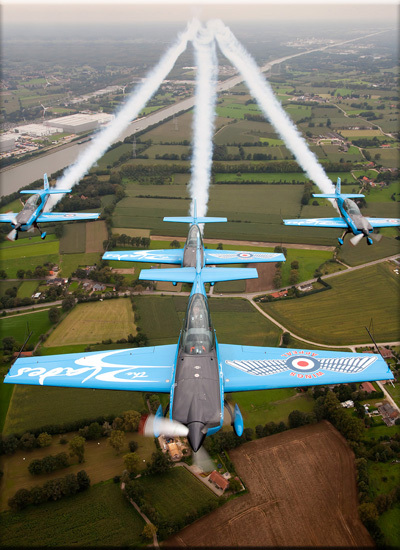 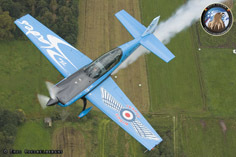 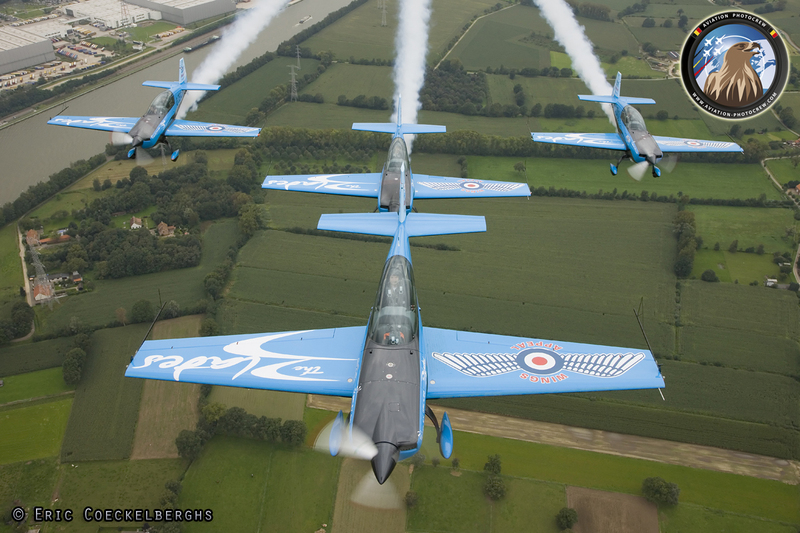 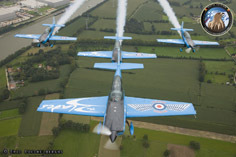 This was followed by another UK demonstration team, the Blades. 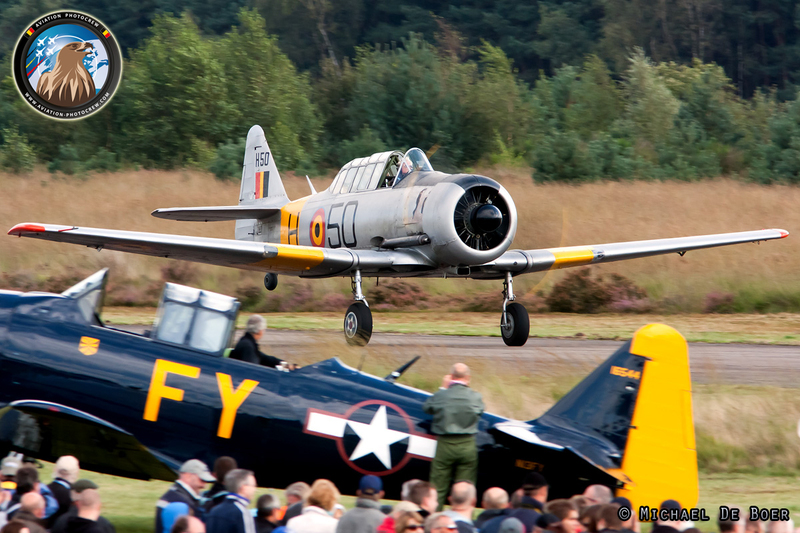 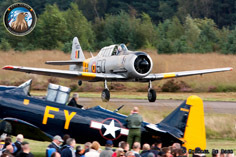 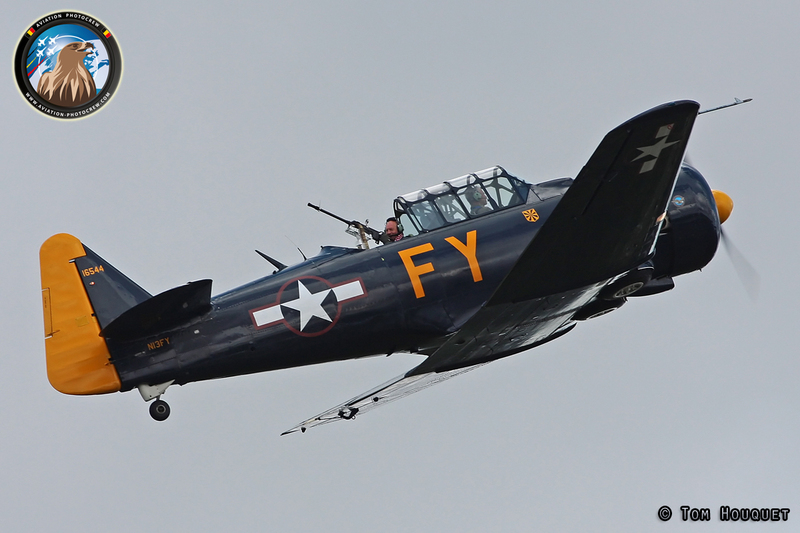 Another welcome act was the airfield attack by three oldtimers, the Dutch Texan, Belgian Harvard and French Zero. 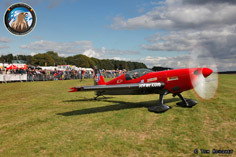 They set up a nice show and the famous radial engine sound reflected on the trees. 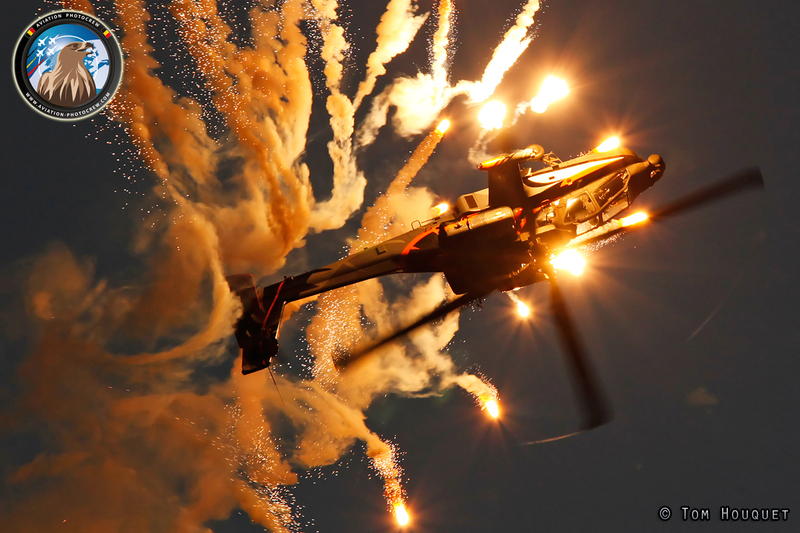 One of the highlights of the evening show, many people came for was the Dutch Apache demonstration. 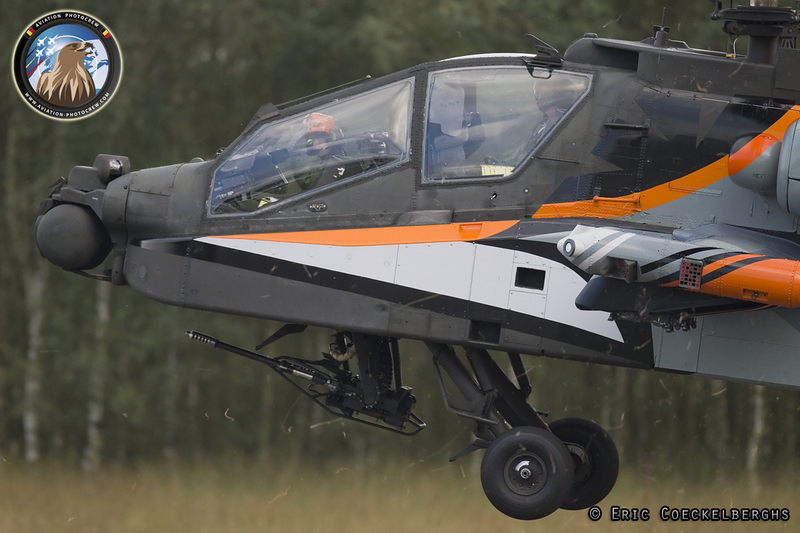 The demo team really shows the Helicopter from all sides and performs maneuvers not often seen, for instance rolls and loops. 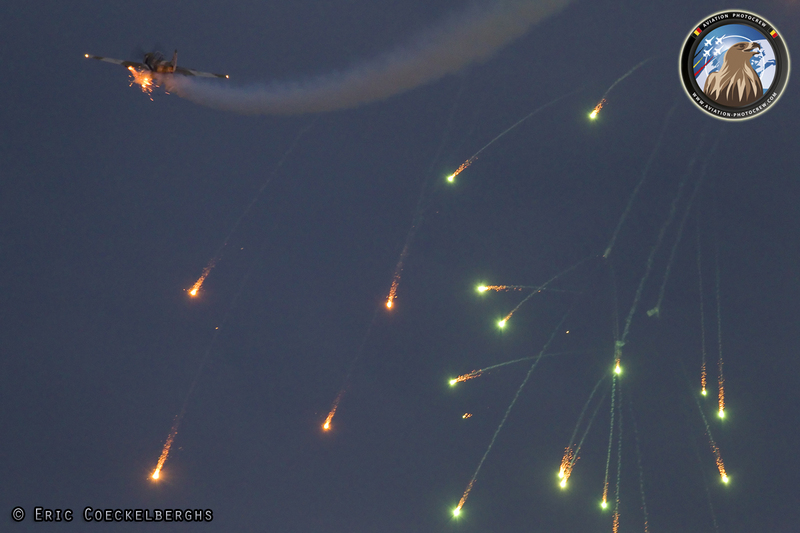 They also make well use of their flare drops which really come out very good against the low light sky. 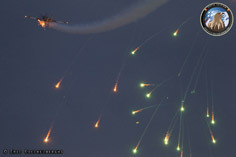 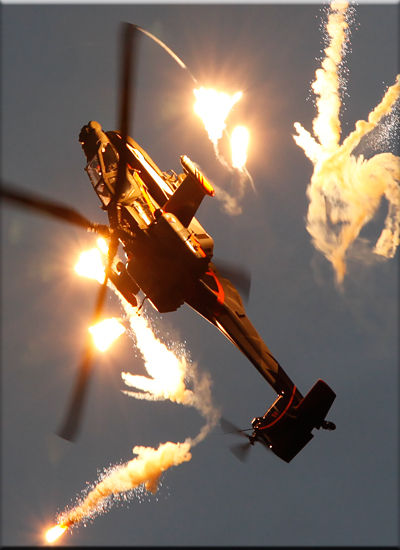 This resulted in very photogenic poses and thousands of cameras were clicking when the Apache released his flares. 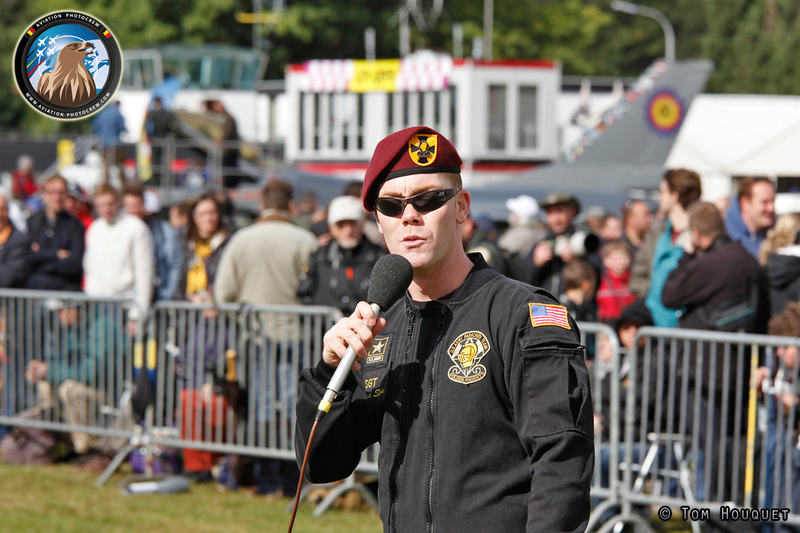 Concluding the show was Mitch Beulen who performed an awesome show in front of his home public. What a great sight and sound it was to see the Afterburner lighter behind the aircraft while passing by at high speed. 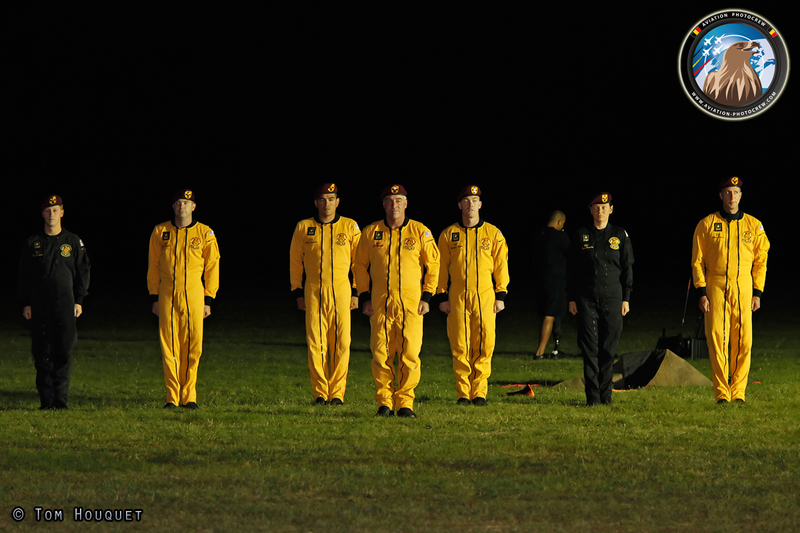 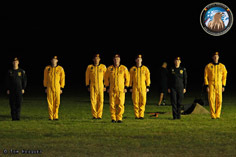 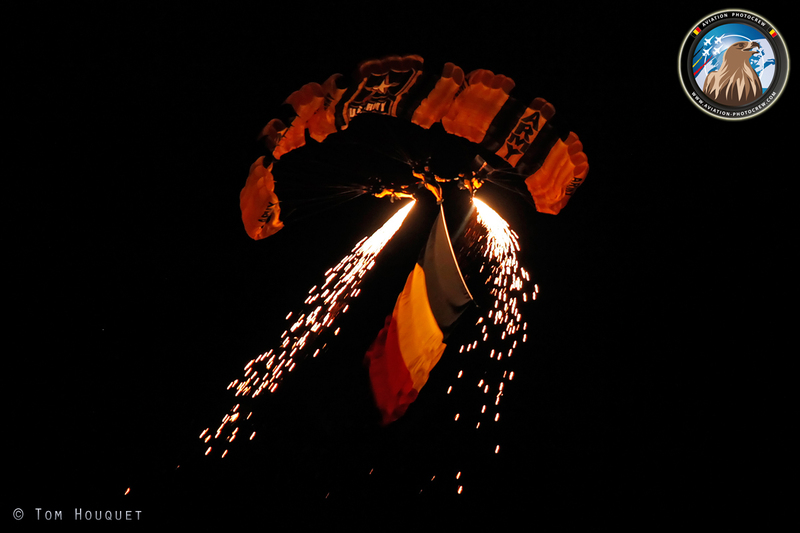 The show wasn’t over yet, during the very last light of the day, the US Army parachute team, the world-famous Golden Knights set up a great show. 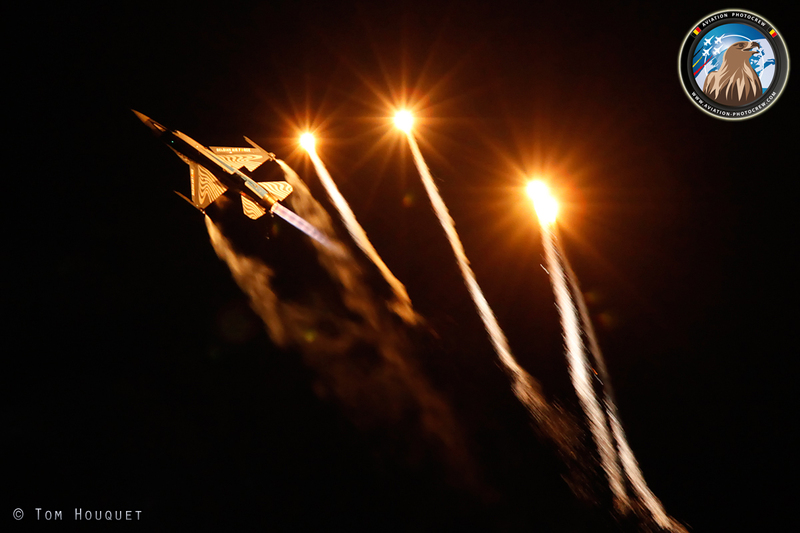 With their special formations, together with the fireworks they pleased the crowds. 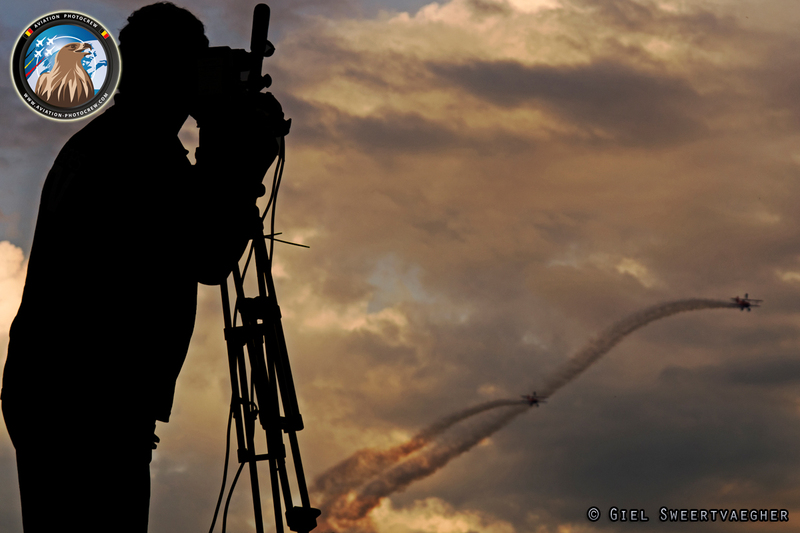 With a nice ground performance, they closed the first airshow day and concluded the second sunset show with great success. 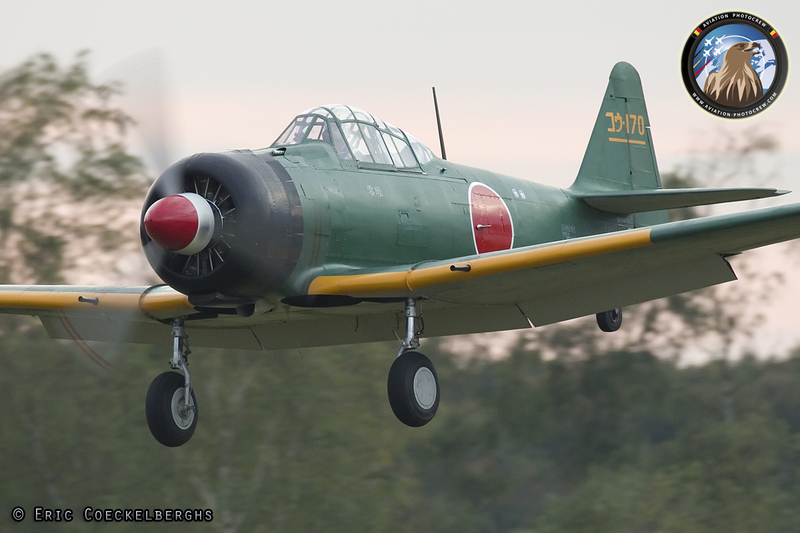 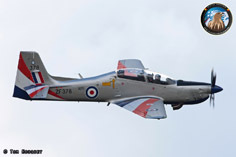 On Saturday some more airshow performers arrived at the airfield and the last rehearsals were flown. 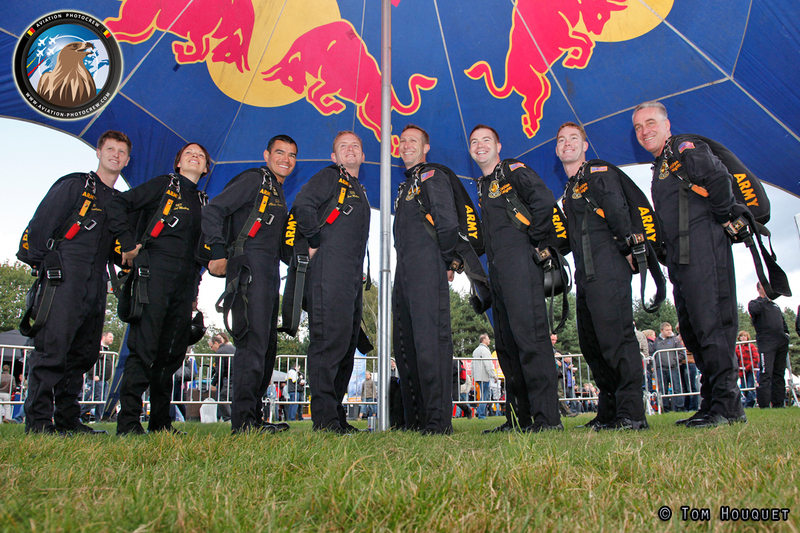 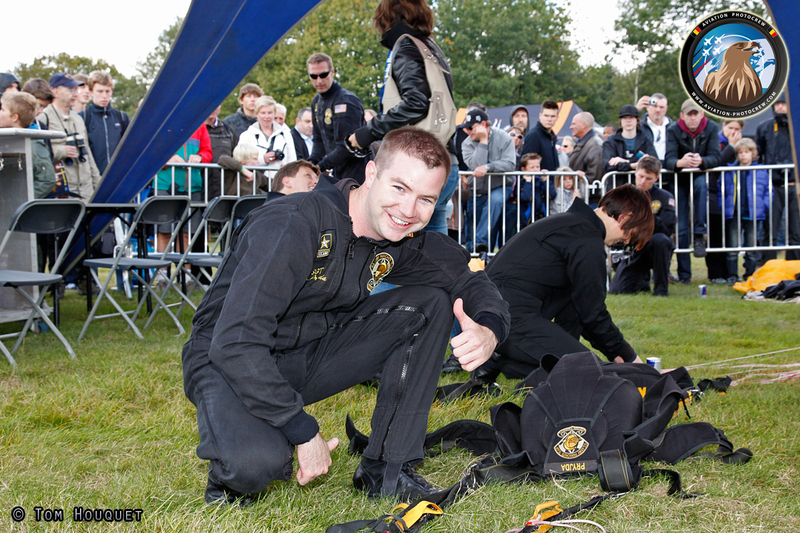 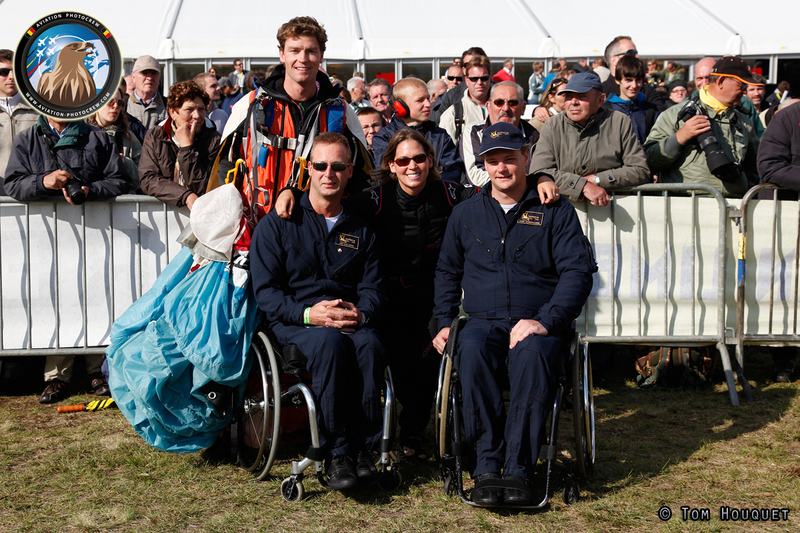 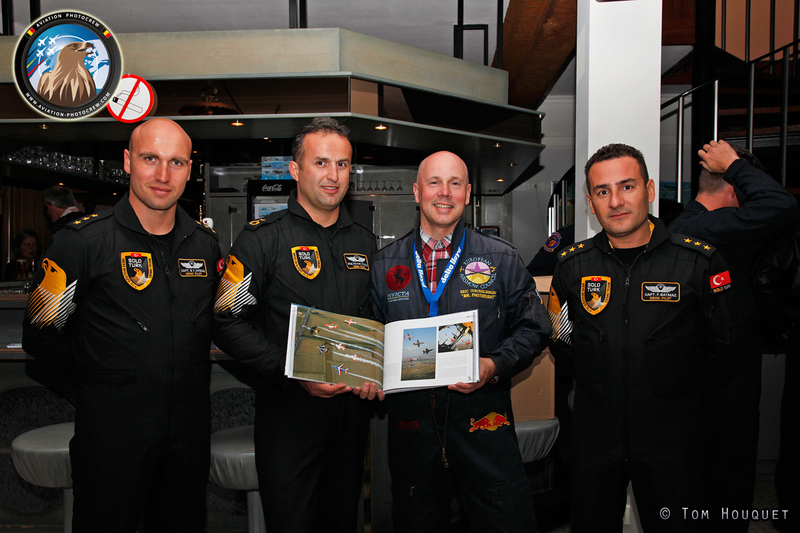 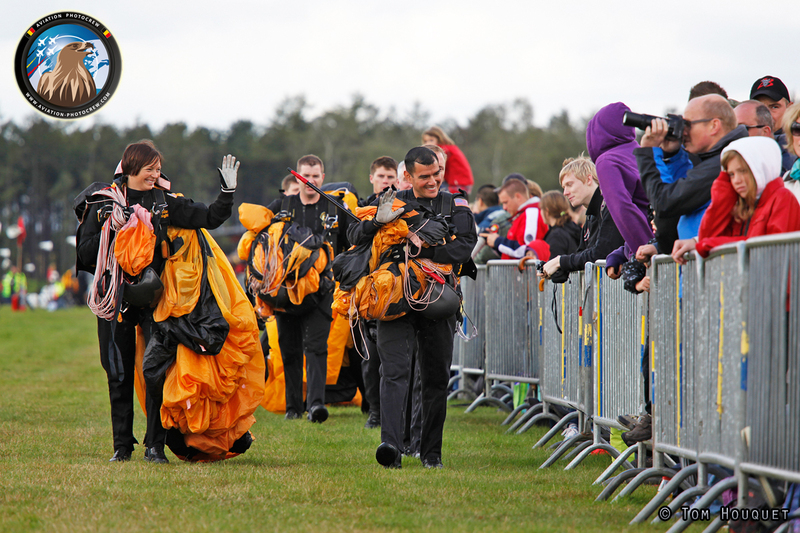 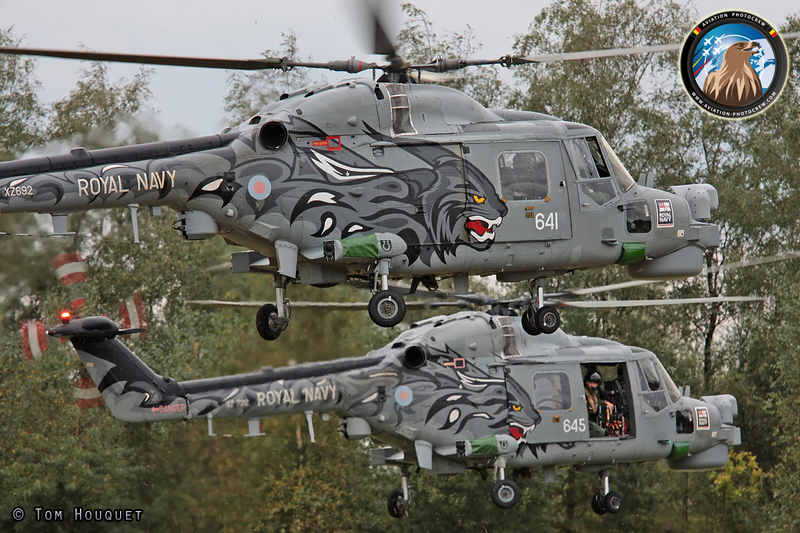 During the day the Royal Navy Black Eagles team was one of the teams who arrived, flying a duo Lynx Helicopter show. Everything was fine-tuned for the Sunday airshow program which had a nice varied line-up. 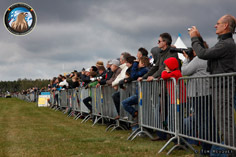 On Sunday morning airfield woke-up early and the public was streaming in. 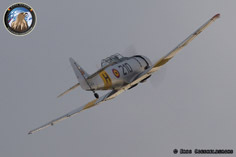 Weather was looking great with a blue sky with some nice clouds which creates a nice background for the photographers. 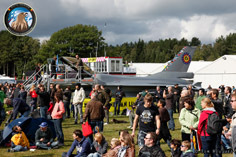 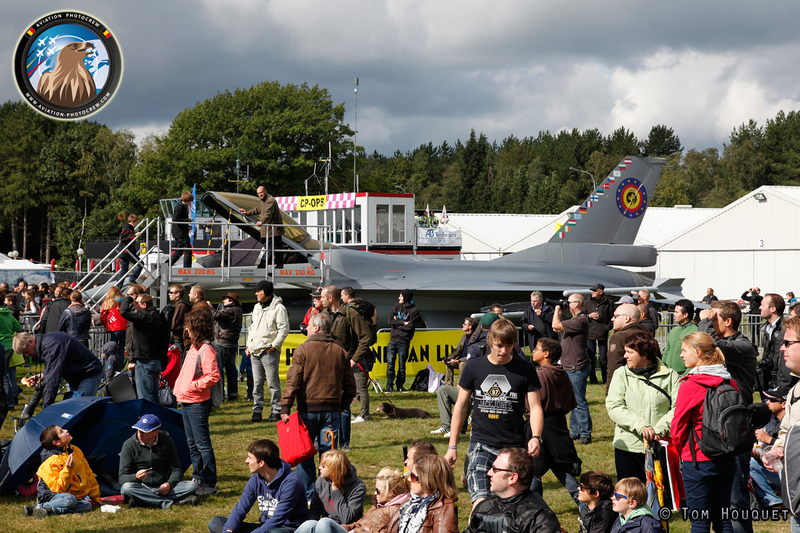 During the day the public could enjoy demonstrations ranging from aircraft of the very early days till the modern Jet Fighters. 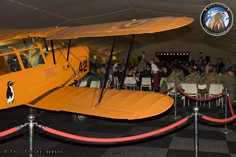 Oldtimer aircraft were present like the Ryan PT-22 and the Stearman, Harvard, Texan, Zero and P-40 to name a few. 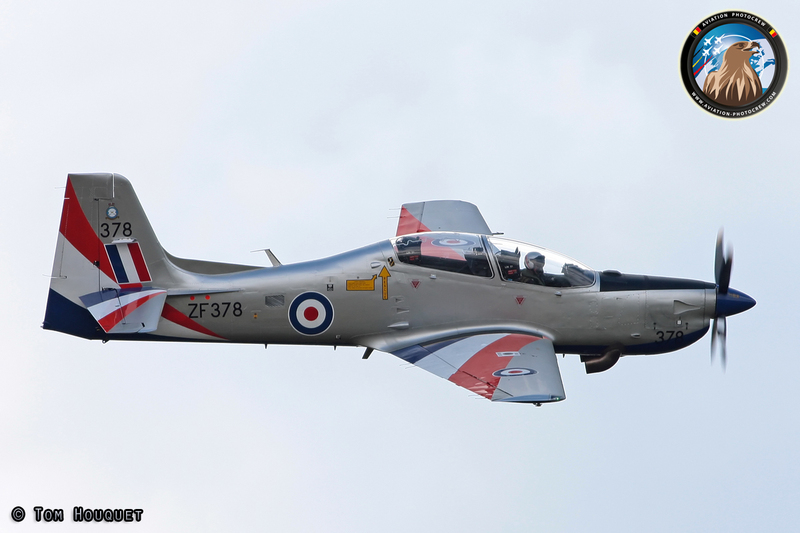 The Royal Air Force training aircraft were well presented during the day with the Tutor, Tucano and Hawk display, putting up a great show. 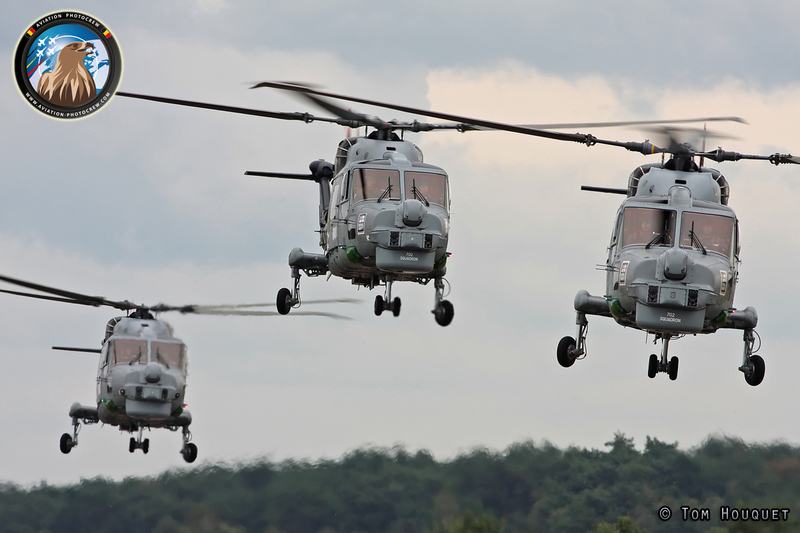 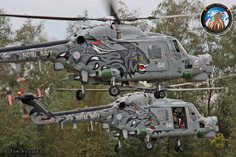 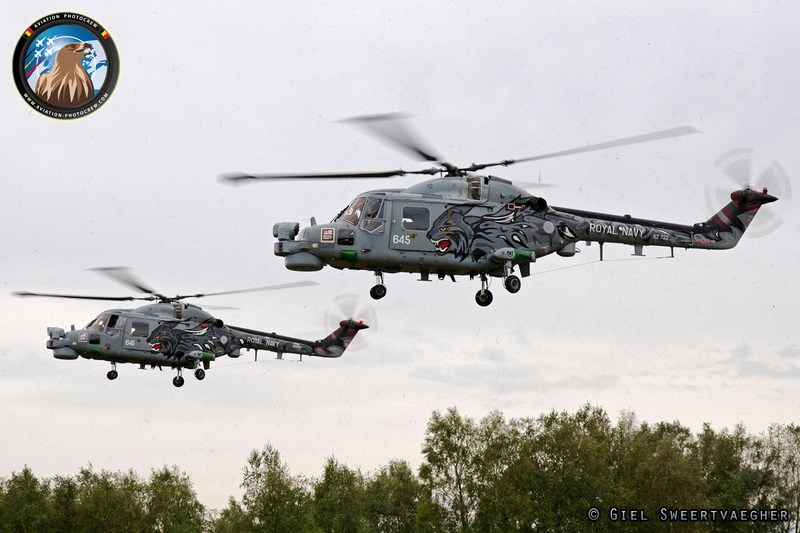 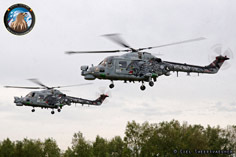 The Royal Navy Black Cats joined their UK colleagues with their duo Lynx demonstration. 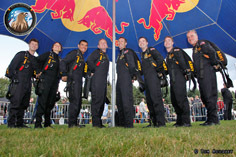 They were not the only UK performers as three other teams were participating the show. 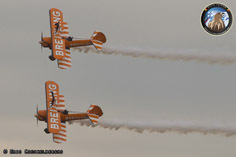 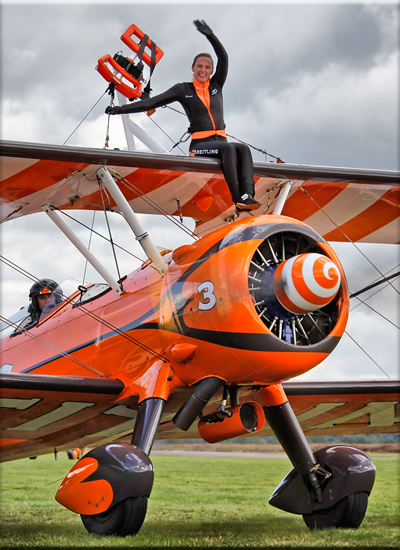 The Breitling Wingwalkers pleased the crowds with their Boeing Stearmans and the wingwalking girls. 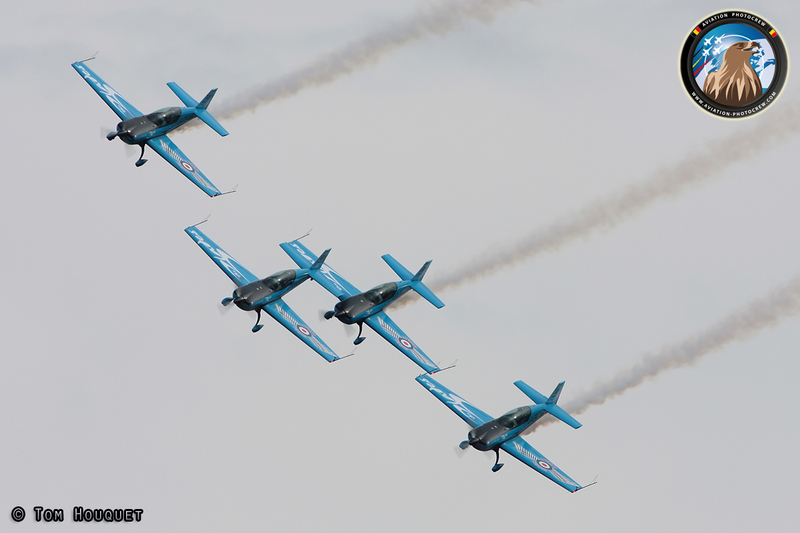 The Blades also put on an awesome show with very close formations and stunning breaks and unique maneuvers. 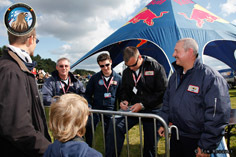 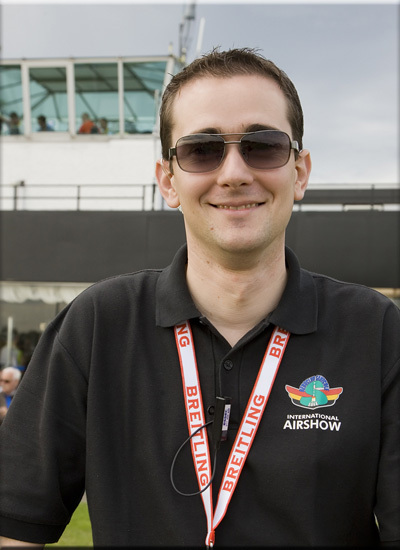 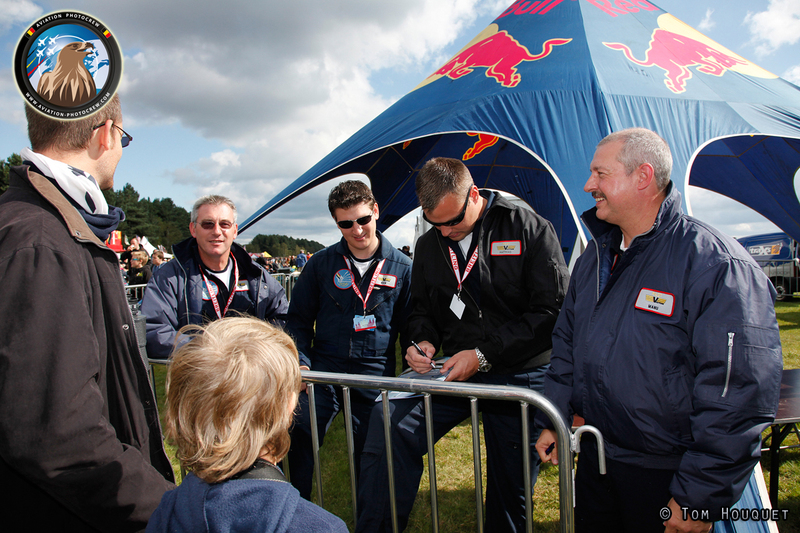 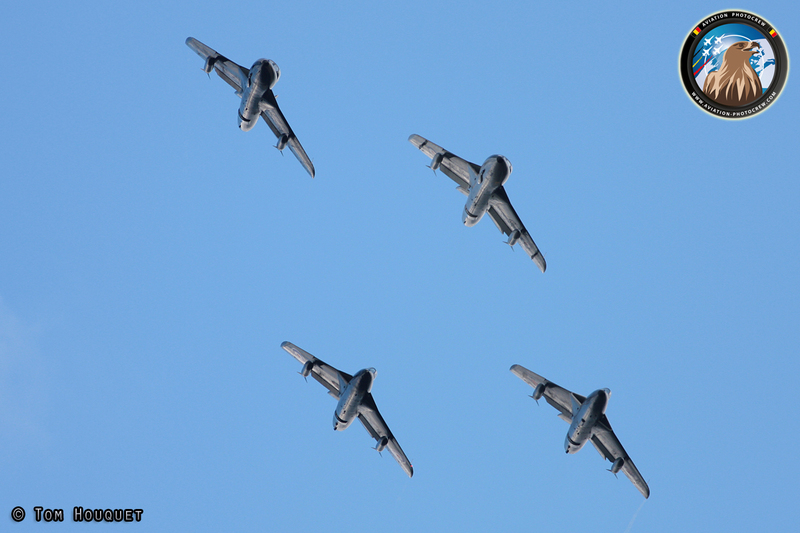 Team Viper was also a very welcome guest at the show flying their four Hawker Hunter Jets. 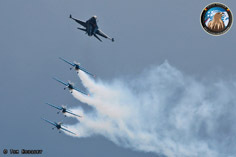 Sanicole has always been able to attract great Jet demonstrations by foreign Air Forces, and this year was no exception. 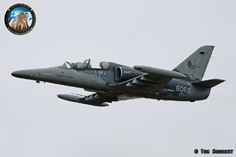 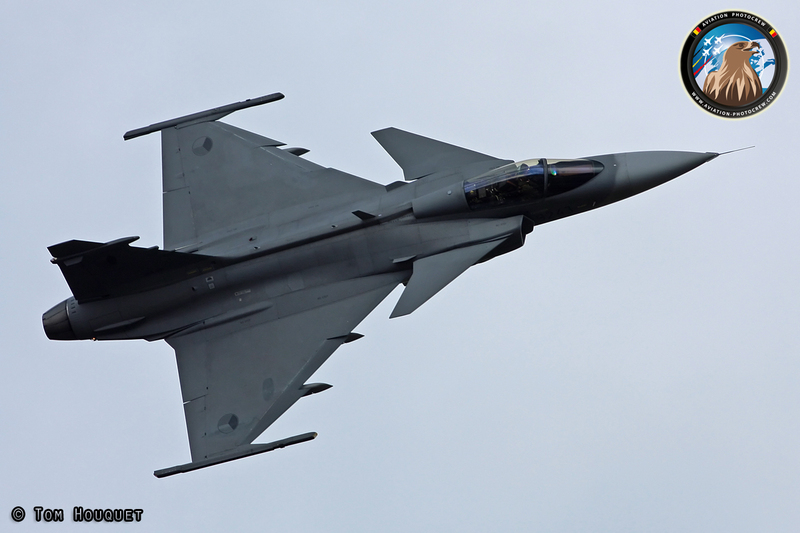 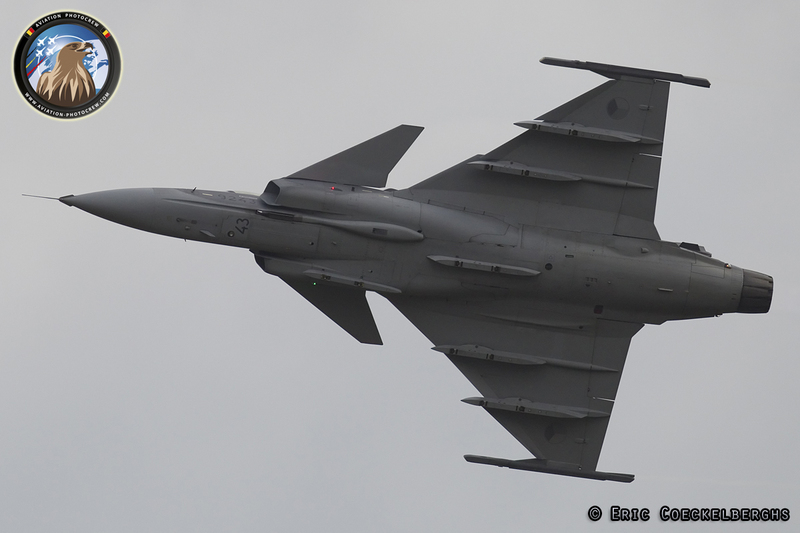 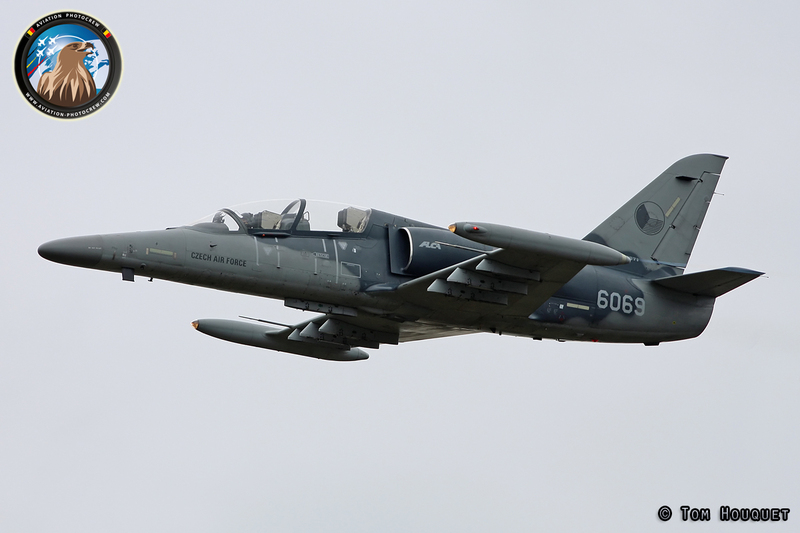 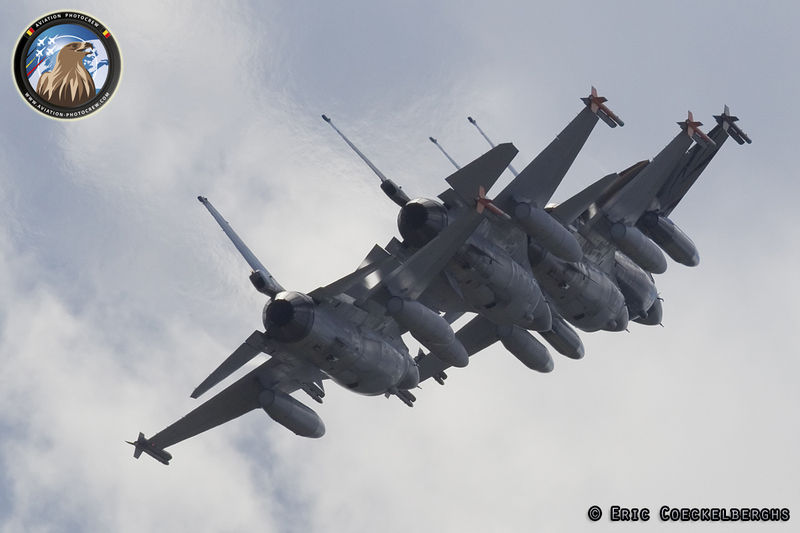 The Czech Air Force was well present with their L-159 ALCA and the Saab Gripen Jet flying a very energetic display. 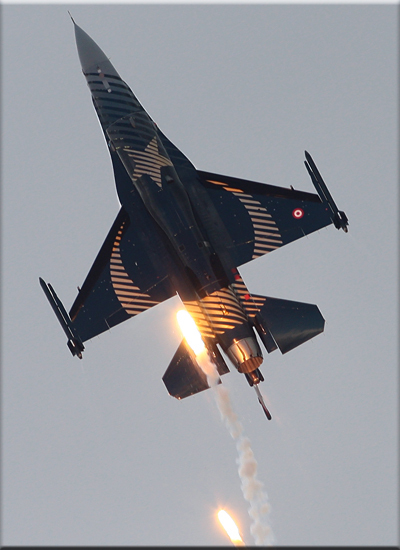 One of the highlights of the show was the demonstration by the SOLO TÜRK F-16 flown by Maj. Plt. Murat KELES. 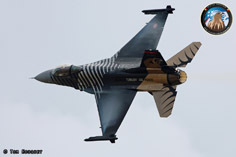 This is very much appreciated by the many Turkish visitors living close-by and coming especially to see their hero. 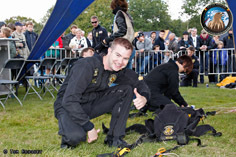 Helicopter demonstrations could not be missed at the show. 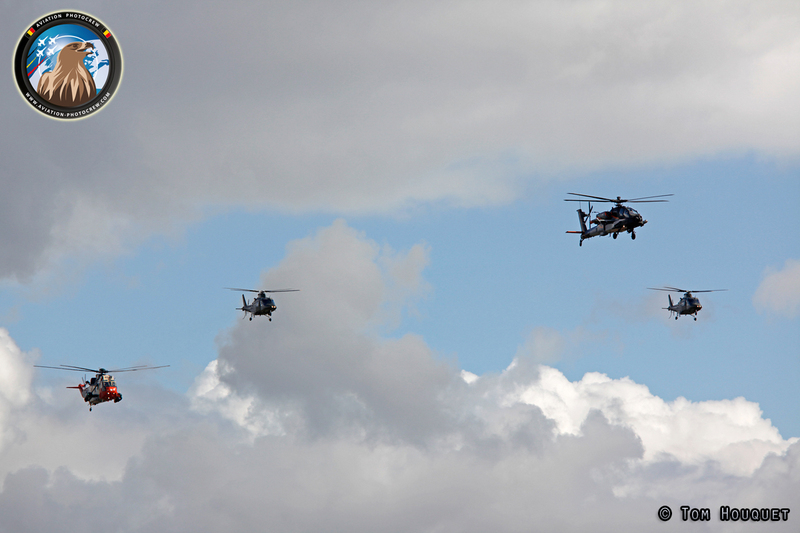 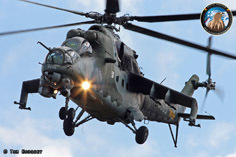 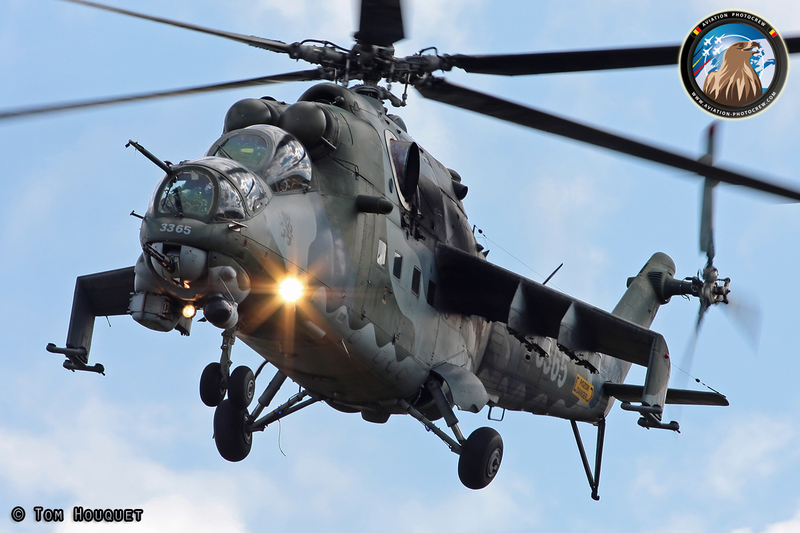 The Dutch Apache flew again a stunning show as well as their Russian build counterpart, the Czech Mi-24 Hind. 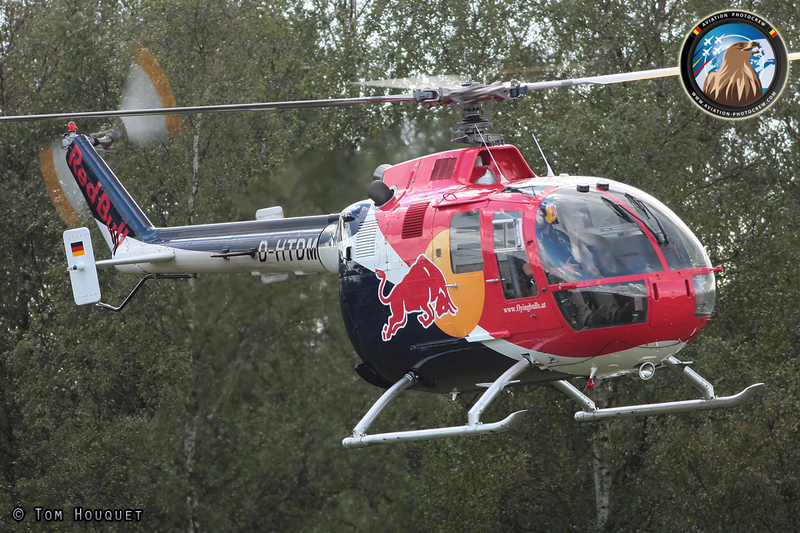 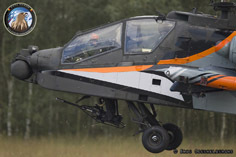 One of the most amazing aerobatic Helicopter display was flown by the Red Bull BO-105. 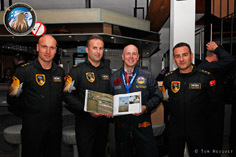 The Belgian Air Force could not be forgotten at the show, and the Agusta A.109 demo team showed their Helicopter around. 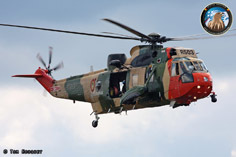 Off course the famous Sea King Helicopter of the 40th Sqn of Koksijde was again a crowd pleaser with their rescue demonstration. 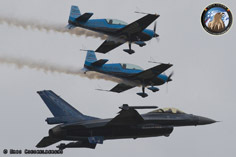 Other formation teams participating the show were the Belgian formation team, the Victors, flying a five-ship formation. This year they enhanced their performance with the use of smoke generators. 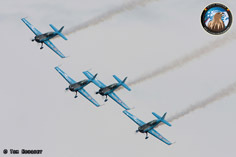 Coming all the way from Romania were three Yak-52’s of the Romanian Aerobatic team who did a very nice demonstration. 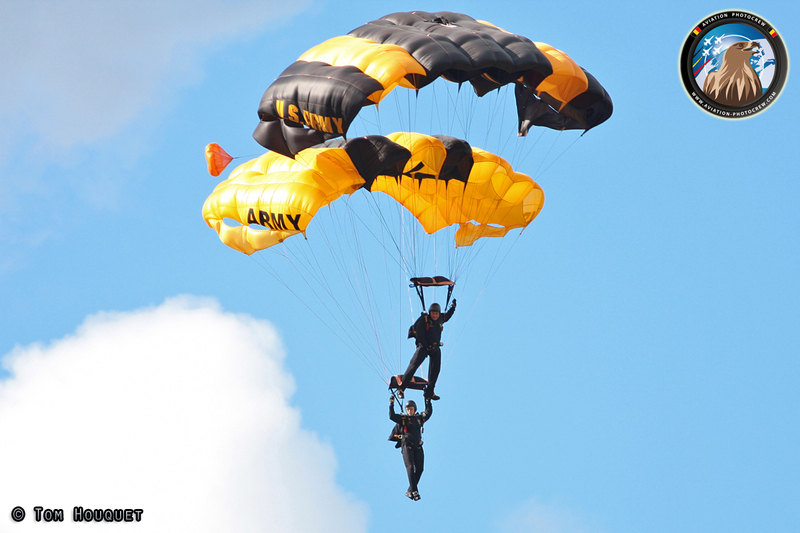 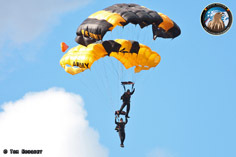 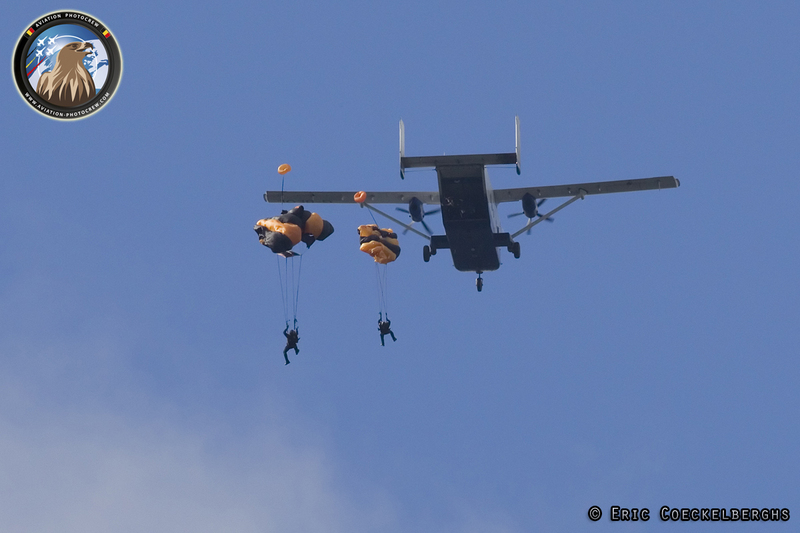 During the afternoon the US Army parachute team, the Golden Knights, flew their great show with special formations, and flying a huge Belgian Flag over the airfield. 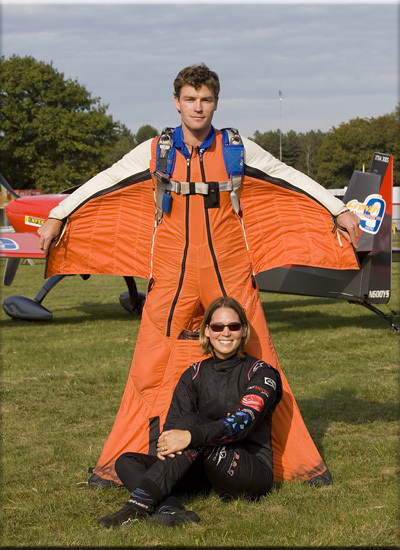 Melissa and Rex Pemberton put on again their unique combination show. 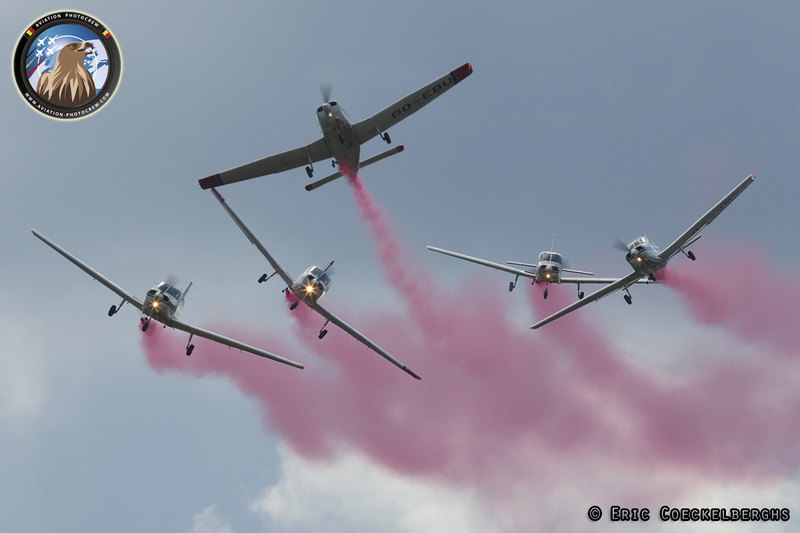 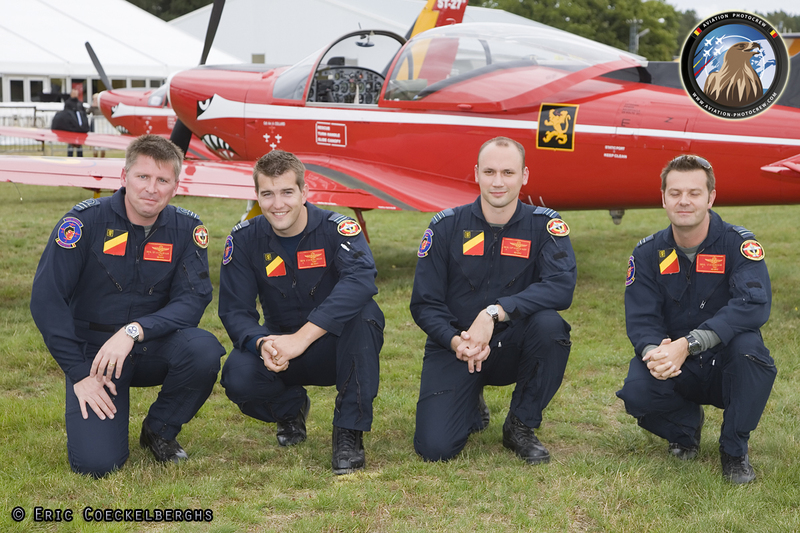 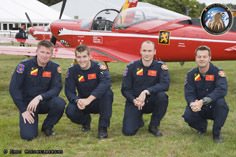 The Belgian Air Force Red Devils demonstration team also performed in front of the home-crowd with their four Marchetti trainers. Sanicole airshow is famous for their unique formations they set up, combining multiple acts together. 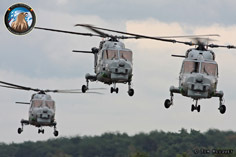 This year was no difference, and a nice Helicopter formation was flown over the airfield, lead by the Dutch Apache, followed by two Belgian Agusta’s and the Sea King. 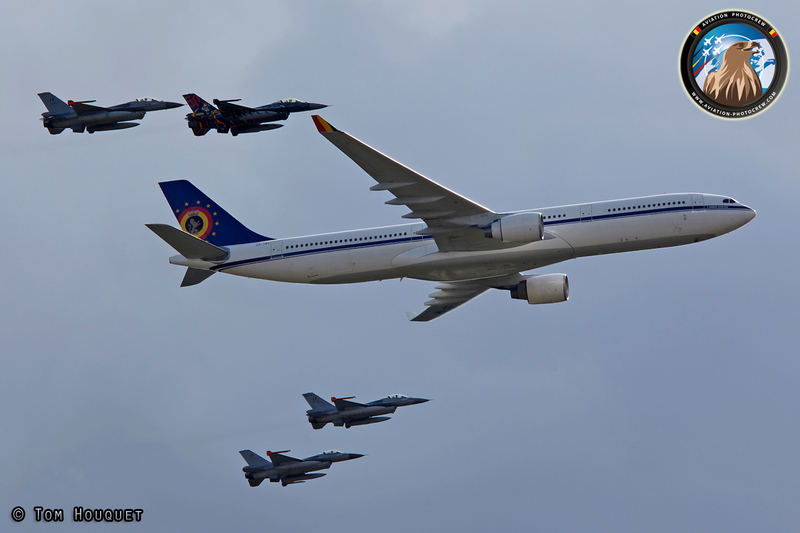 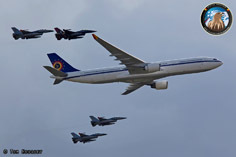 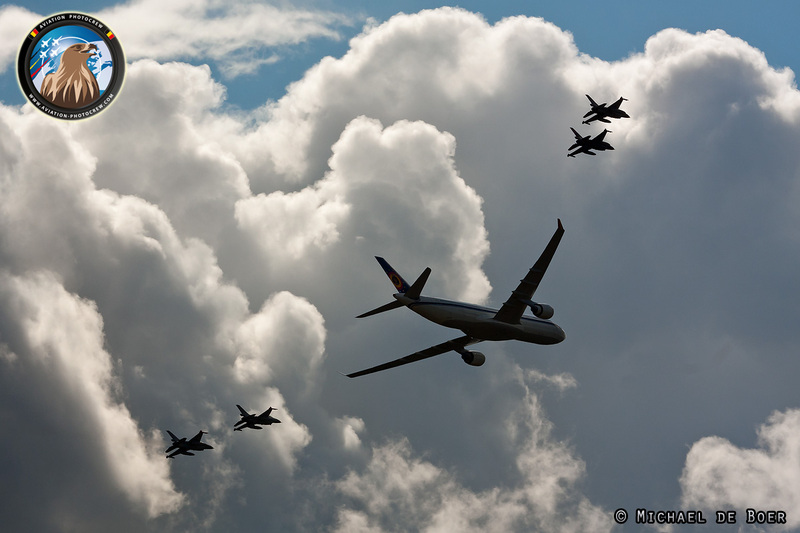 Other unique formations were flown by the Belgian Air Force Airbus A-330 which was guided by four F-16 fighters. 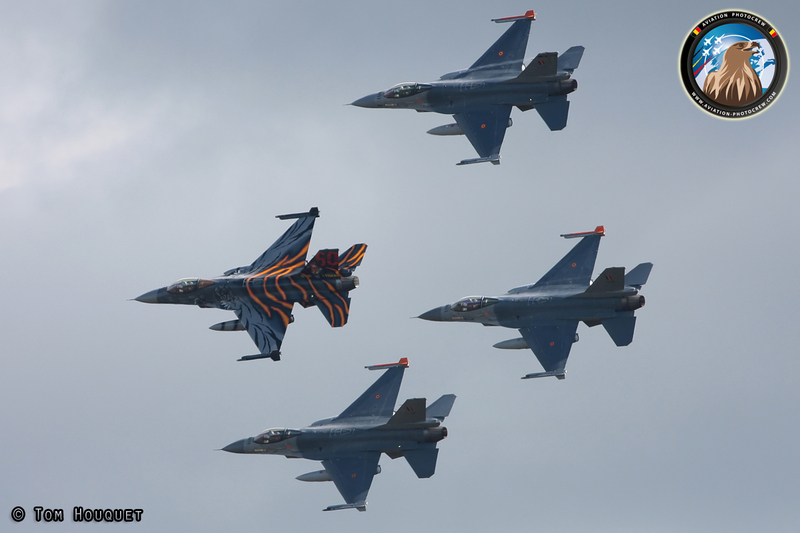 The latter performed their four-ship Tiger formation display which was really appreciated by the local people who see the F-16’s flying every day from the close-by Kleine Brogel Air Base. 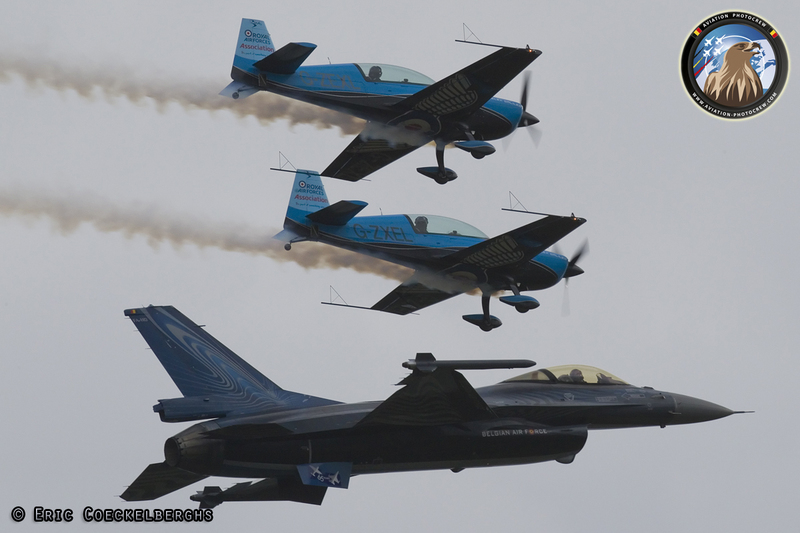 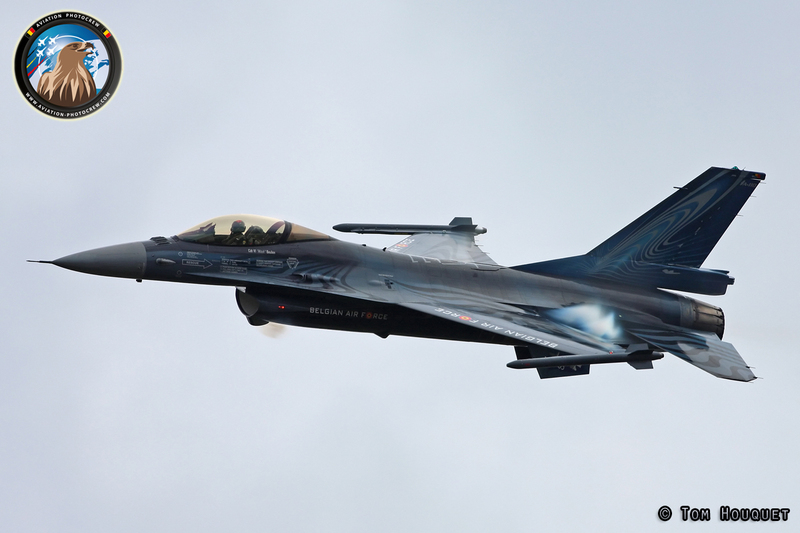 Another special formation flight was performed when the demonstration team, the Blades, were flying together with the Belgian Air Force F-16 solo display, speaking of a nice surprise! 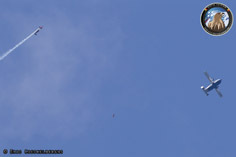 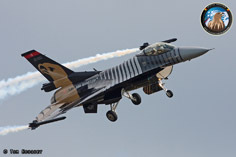 As icing on the cake, Mitch Beulen closed the 2011 show with his F-16 Solo Display. 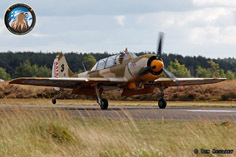 Based at the local Kleine Brogel Air Base, he performed his very last public display in Belgium before giving the torch to a new demo pilot. 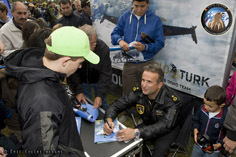 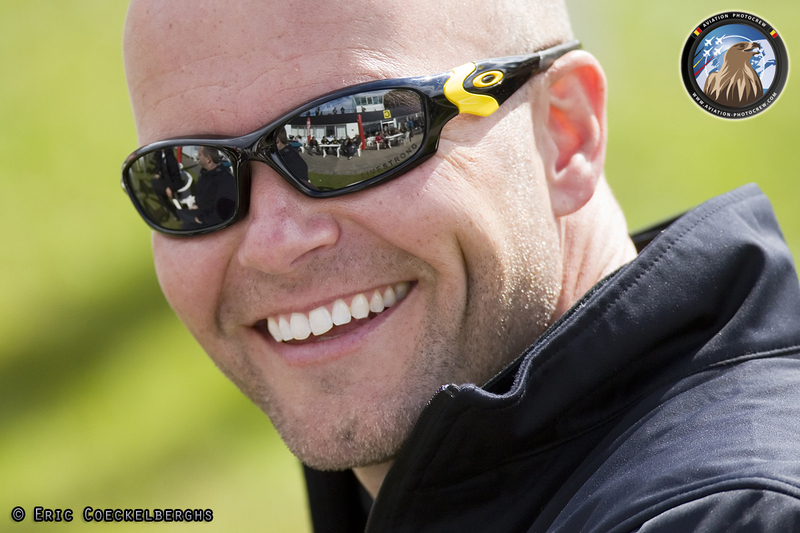 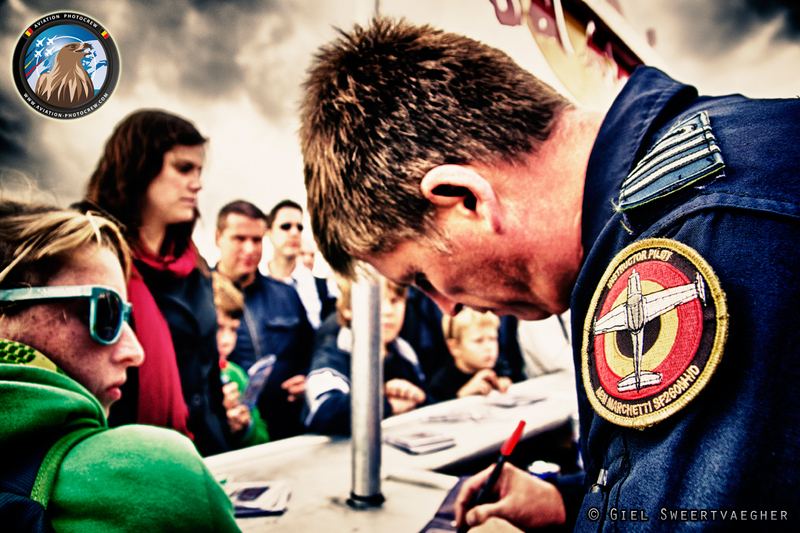 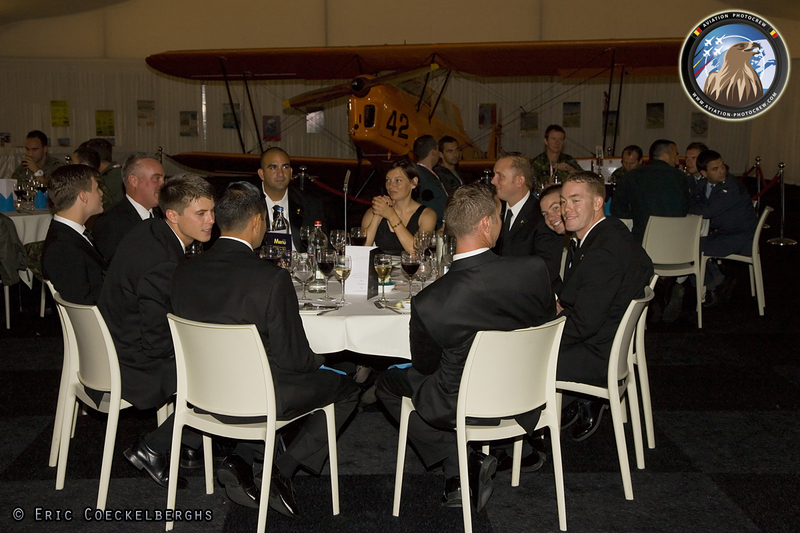 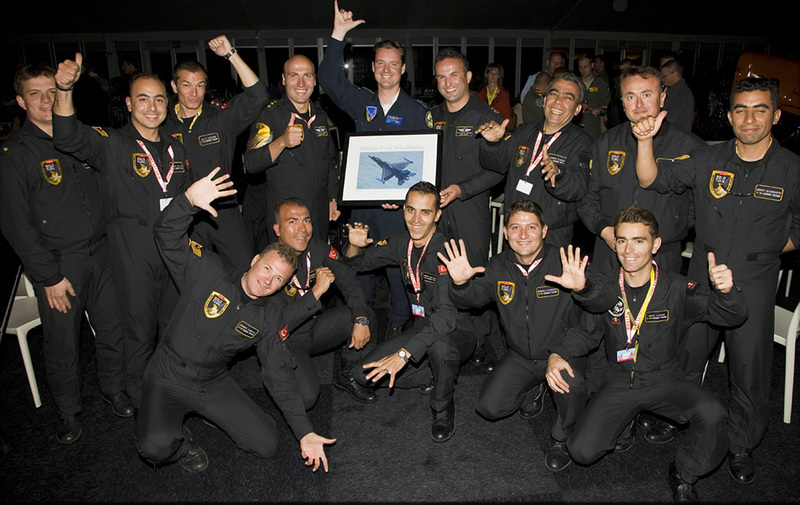 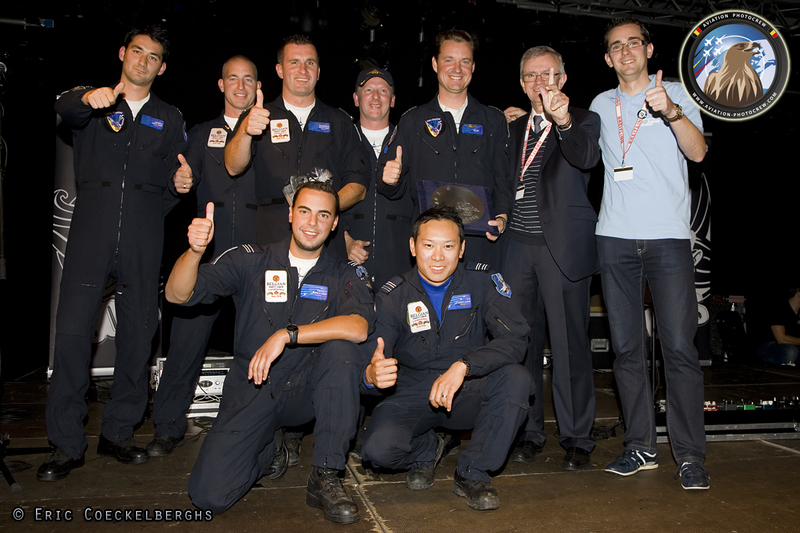 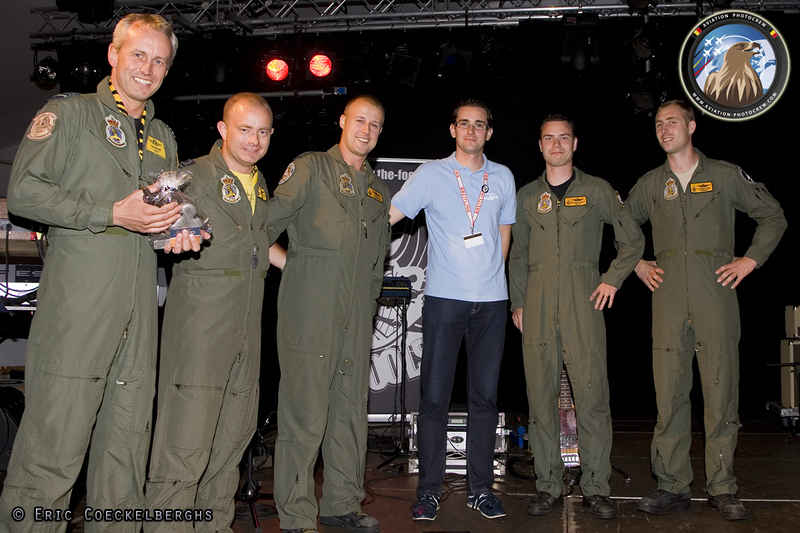 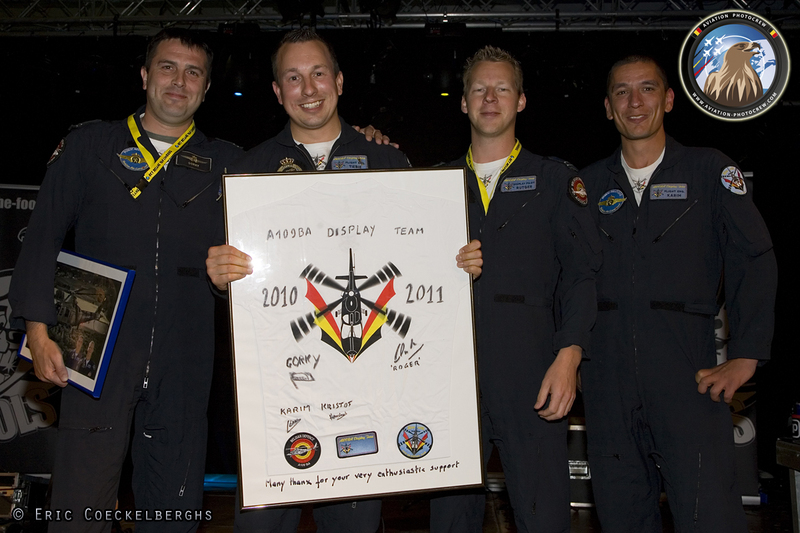 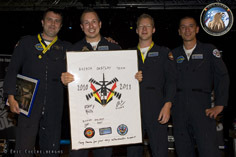 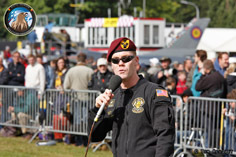 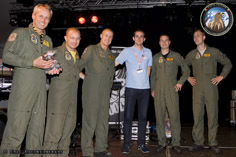 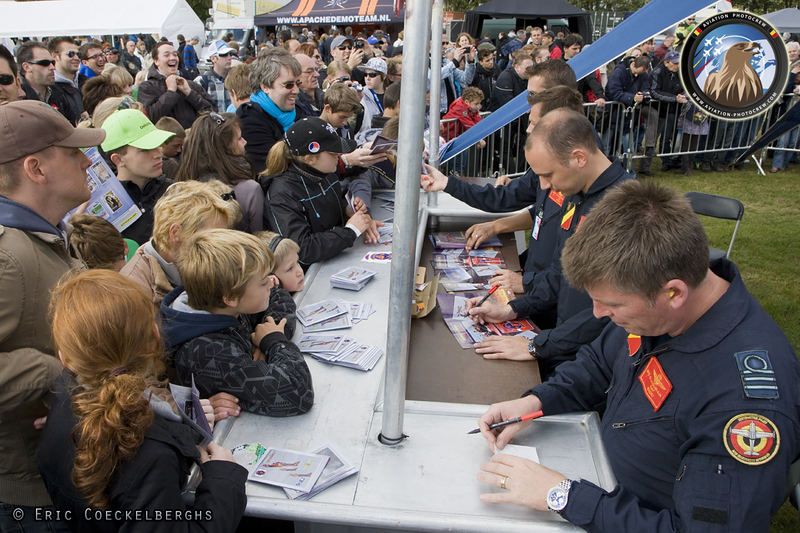 Mitch flew three fantastic seasons in the F-16’s and presented the Belgian Air Force all over Europe. 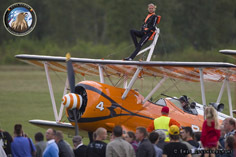 It was a great way to end his display pilot period in front of the local crowd. 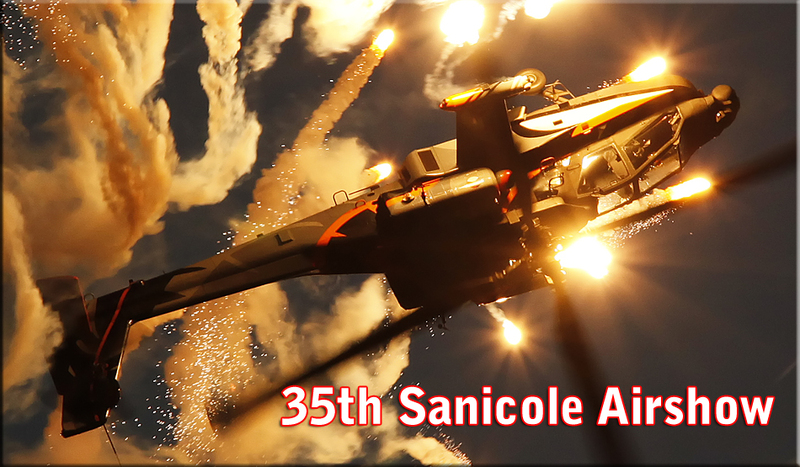 This concluded the 35th anniversary edition of the Sanicole Airshow which was again a huge success visited by thousands of people who enjoyed the great show. 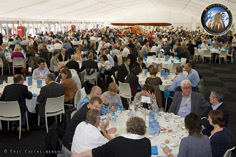 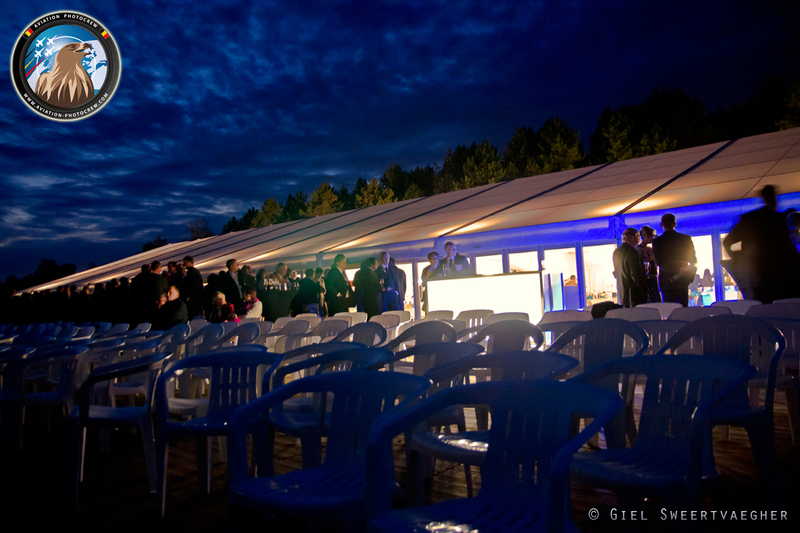 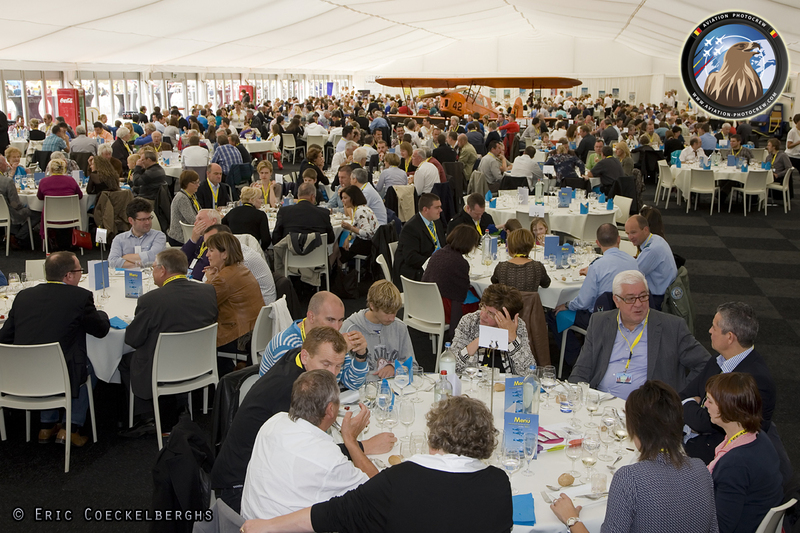 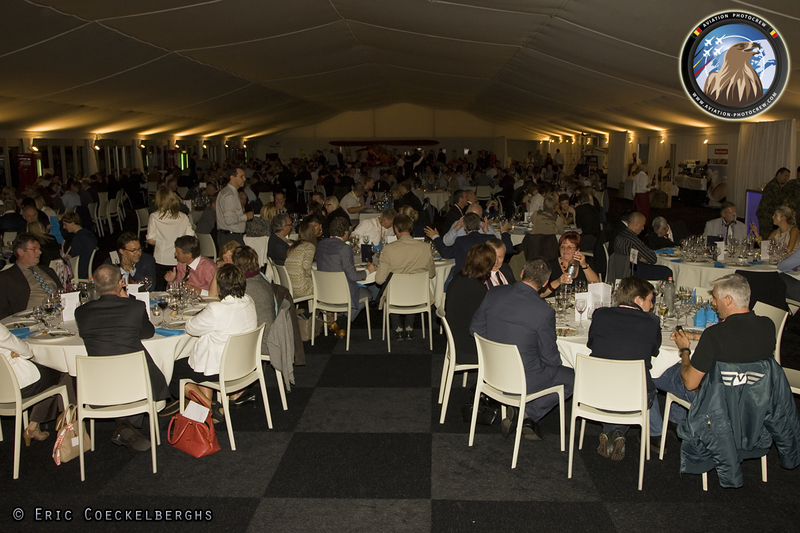 During the Sunday evening, the crews enjoyed the famous Sanicole BBQ in the large tent. This was followed by the handing over of the trophies, thanking all the performers for their participation. 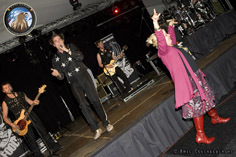 Afterwards they could enjoy a great performance by the music band ‘the Fools’ who warmed everyone up for a great party night lasting till the early hours. 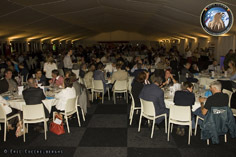 Hereby we would like to congratulate Geoffrey and Gilbert Buekenberghs and the whole Sanicole team for organizing the great event.